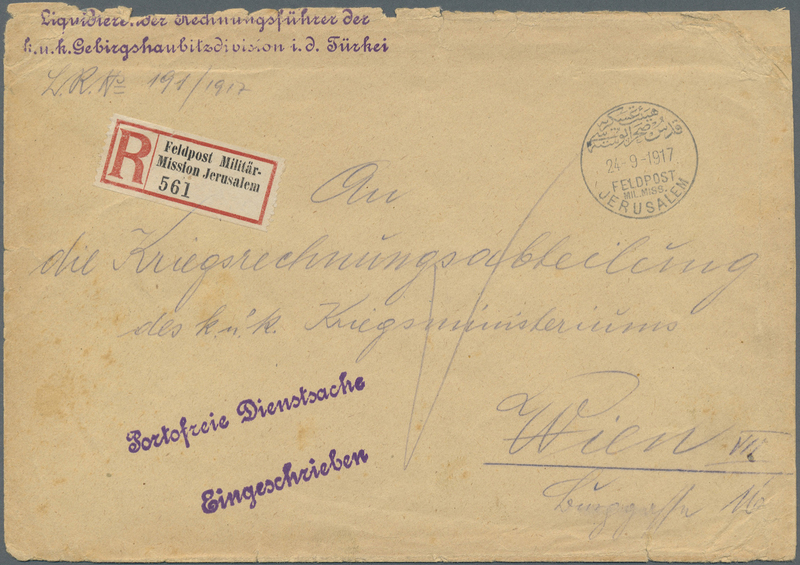 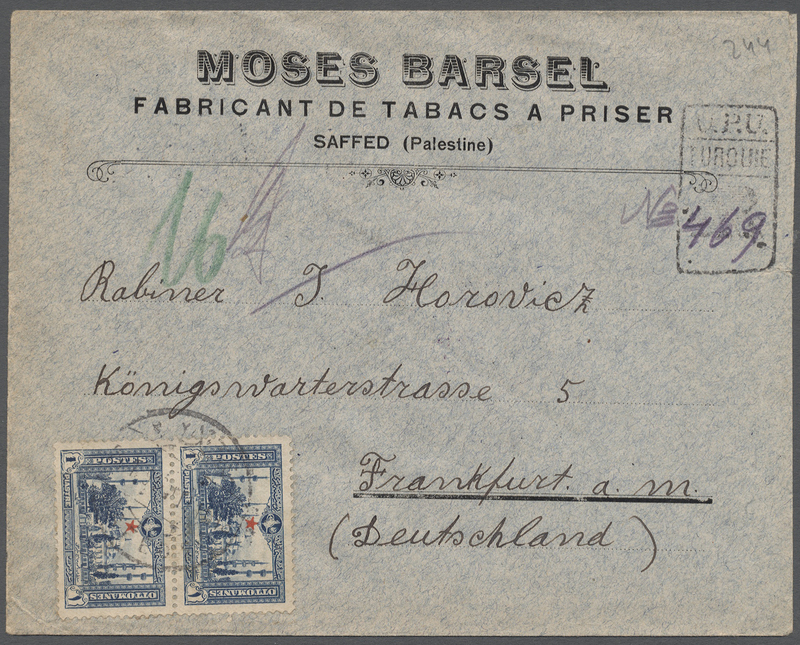 7590 Brief (cover) 1918, large registered cover from Haifa with fieldpost mark "Deutsche Feldpost 365 31.7.18" and register label "Deutsche Feldpost 365" and Official cachet "Kaiserlich Deutsche Feldpost Nr. 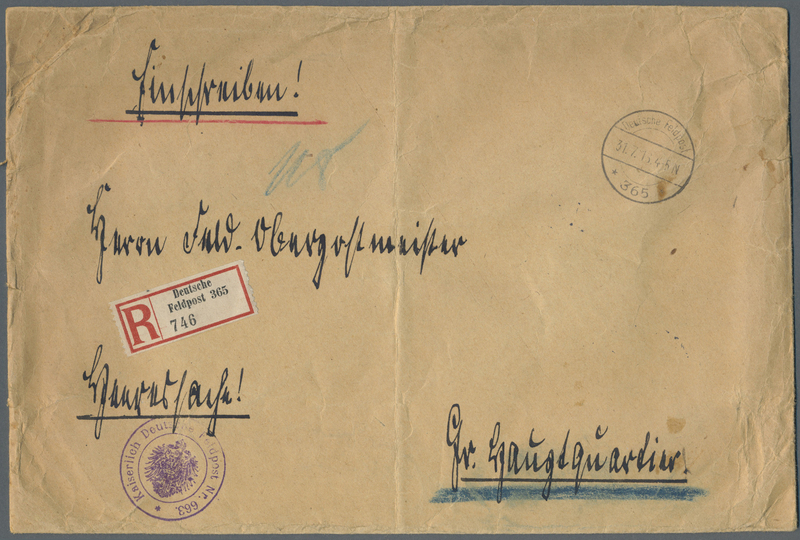 663" to German Grand Headquarters with arrival mark, cover folds, rare ÷ 1918, großer R-Brief aus Haifa mit Stempel "Deutsche Feldpost 365 31.7.18"und R-Zettel "Deutsche Feldpost 365" sowie Briefstempel "Kaiserlich Deutsche Feldpost Nr. 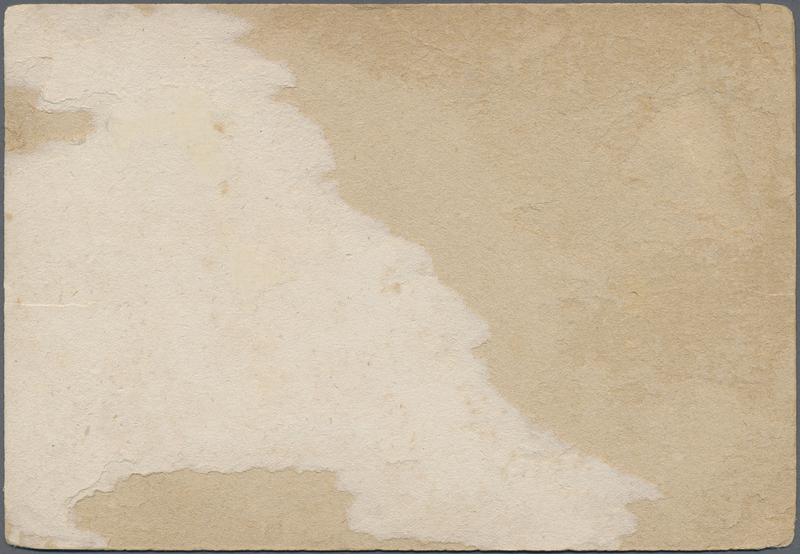 663" an das Gr. 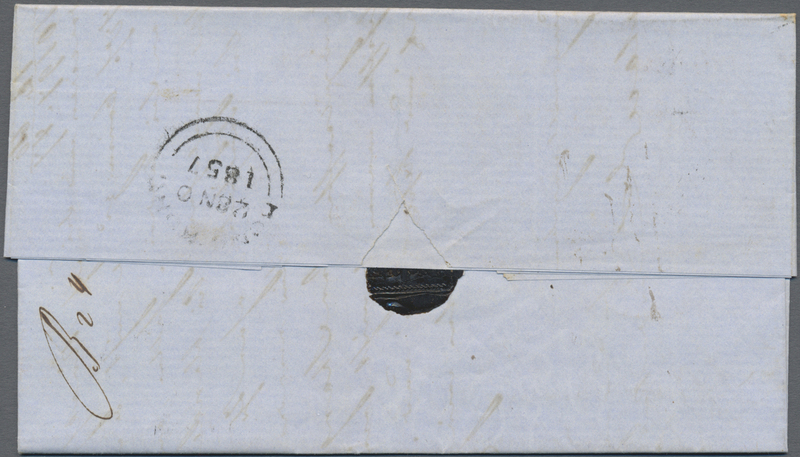 Hauptquartier mit Ankunftsstempel "Deutsche Feldpost 72d 18.8.18", in dieser Kombination sehr selten! 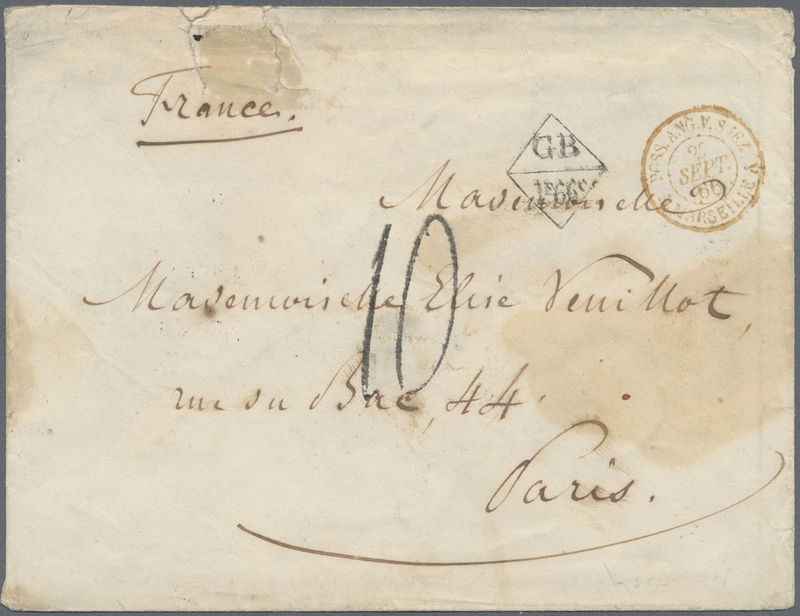 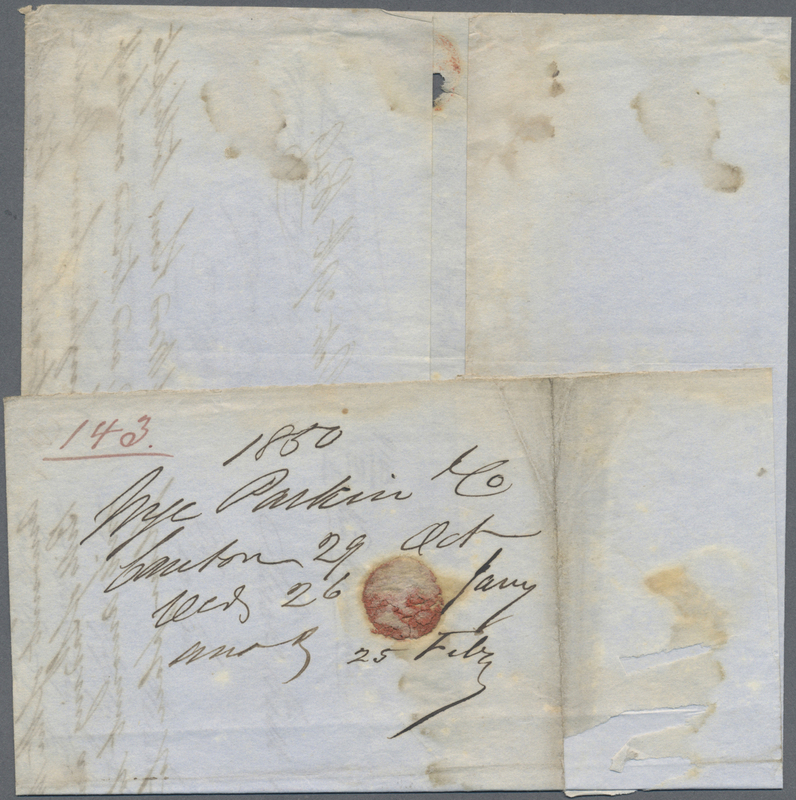 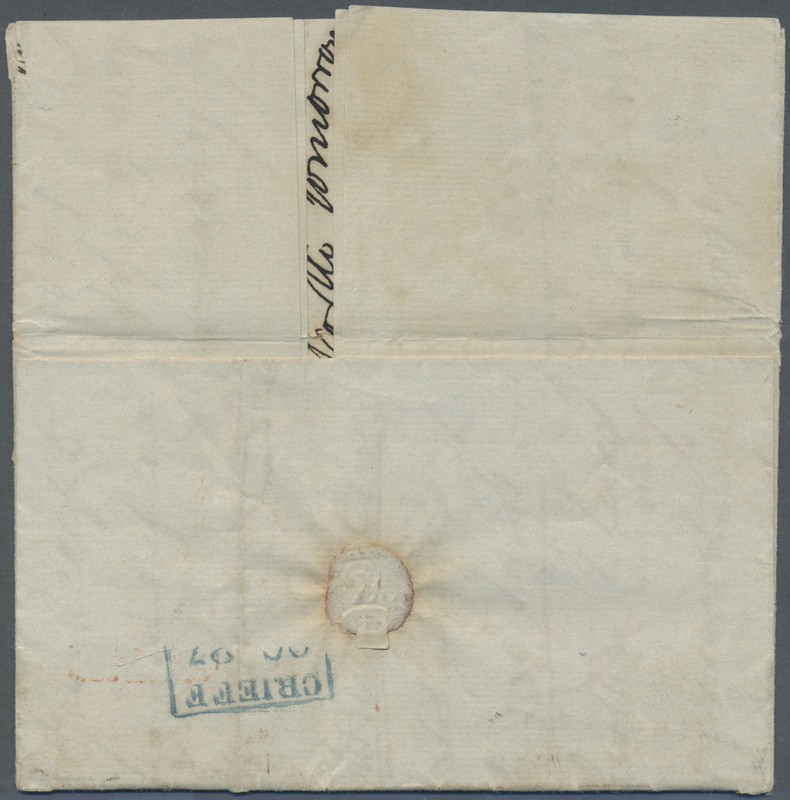 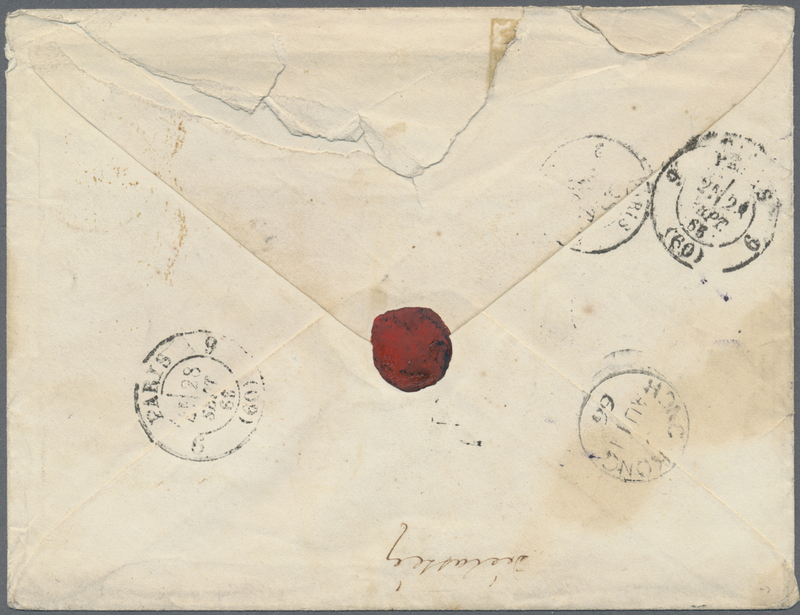 7591 Brief (cover) 1845. 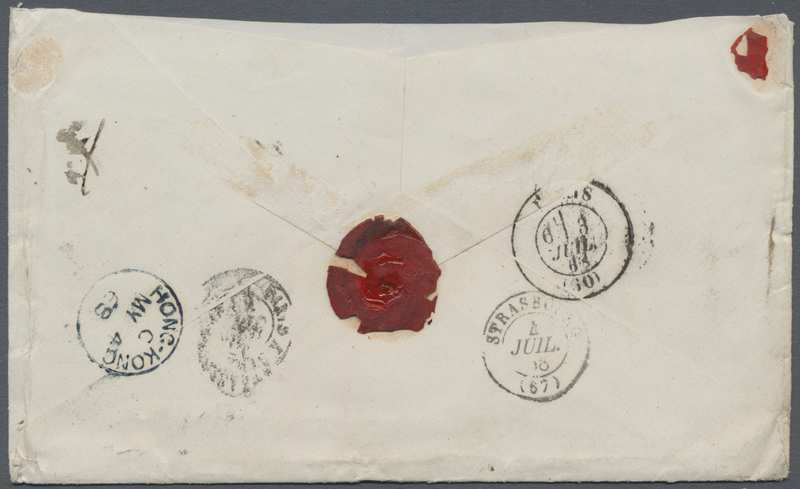 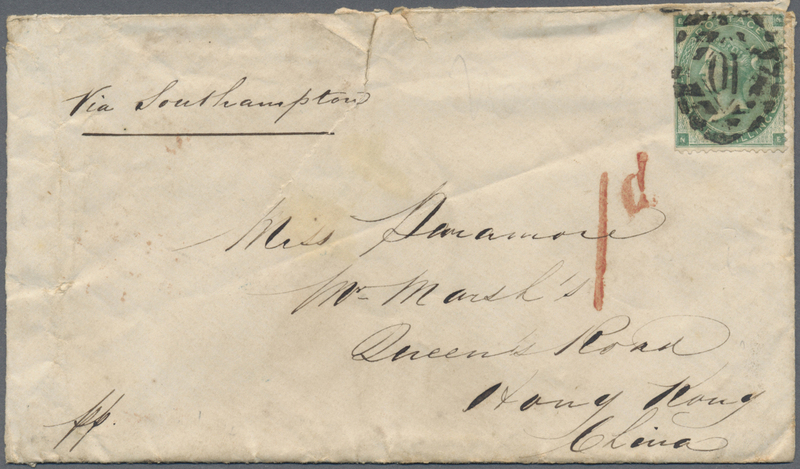 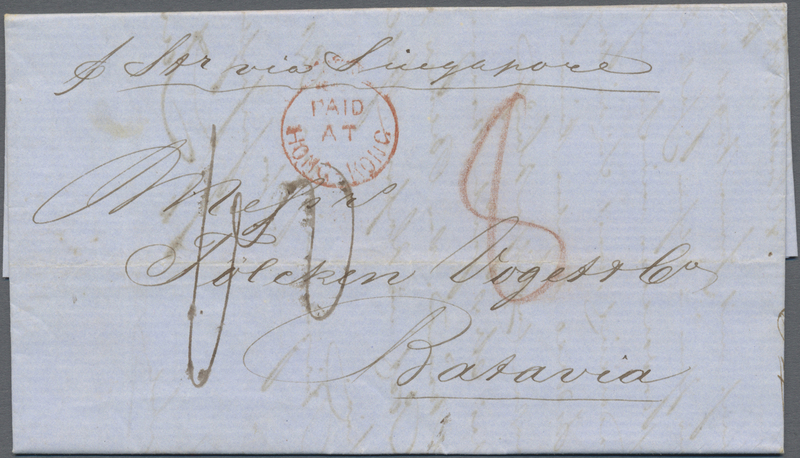 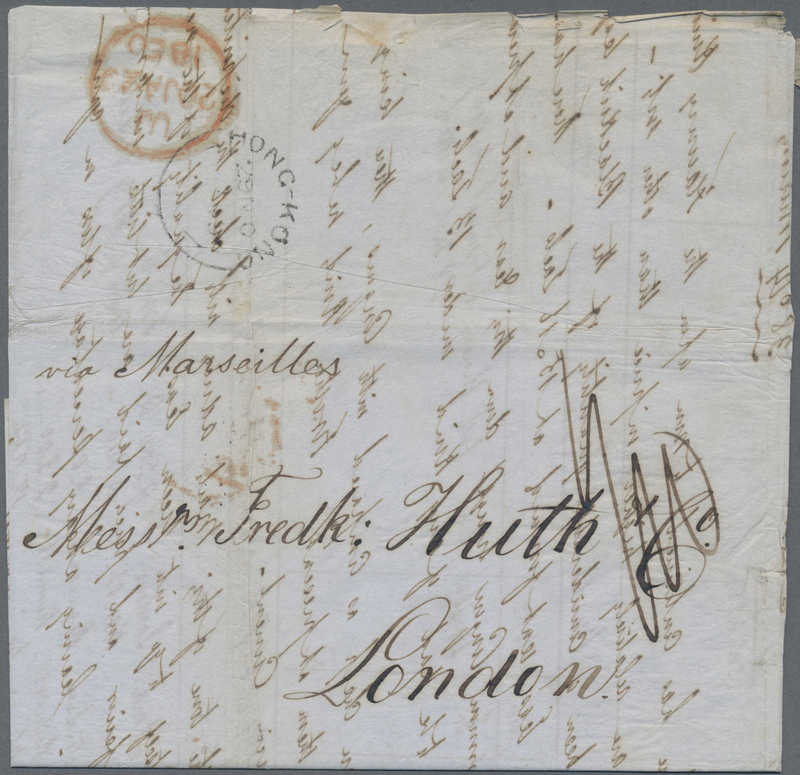 Stampless envelope written from Hong Kong dated '3rd August 1845' addressed to Scotland, carried by forwarding agent to Singapore with framed 'Singapore/Paid' in red and oval 'Forwarded by/Singapore/A.L. 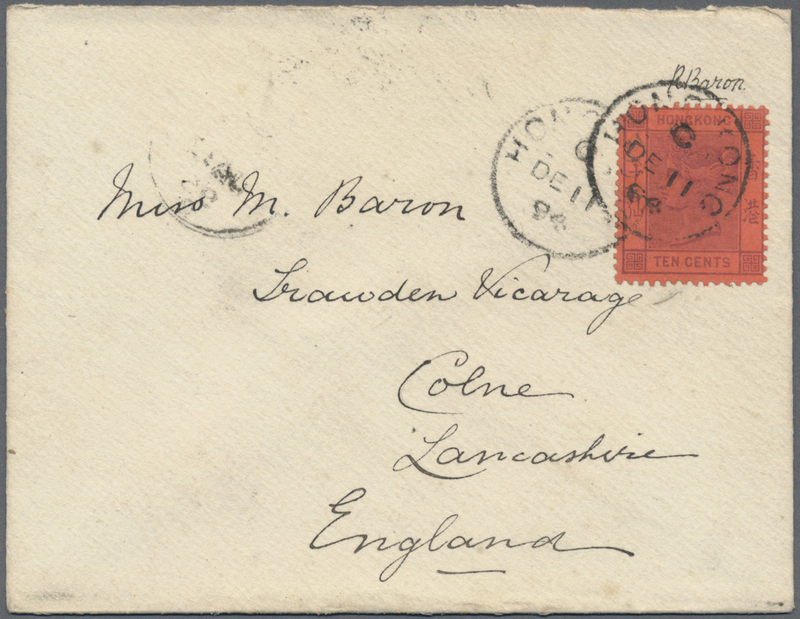 Johnston & Co' on reverse, routed via London, charged '2/3' in m/s on arrival at Castle Strathallien and redirected bearing Great Britain Sg 8, 1d brown tied by '84' with Crieff receiver on reverse 'Oc 30 1845'. 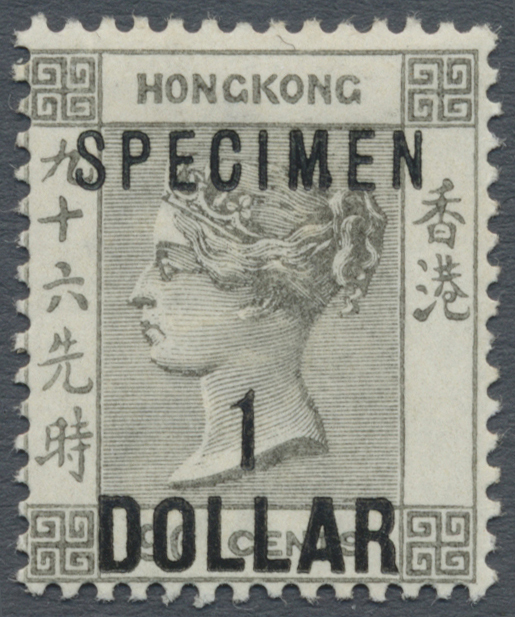 An amazing item full of character. 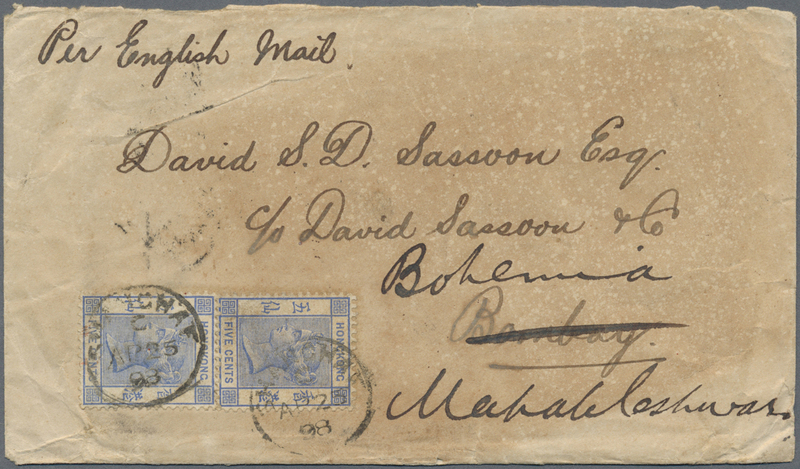 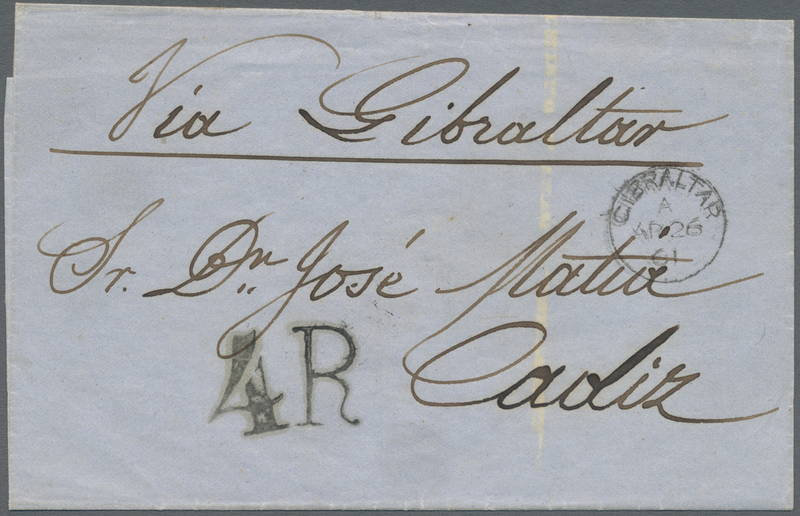 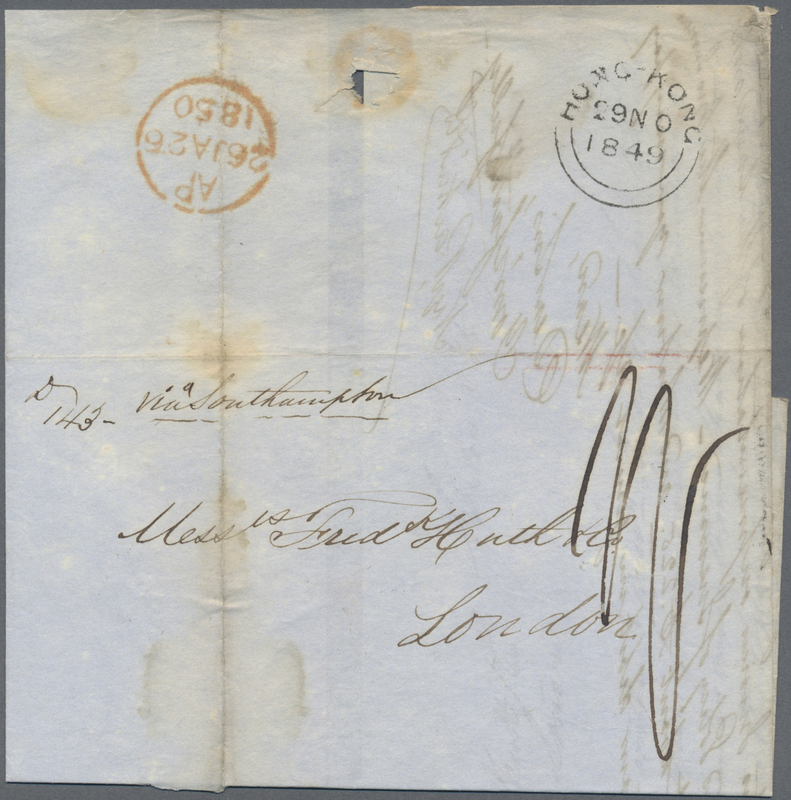 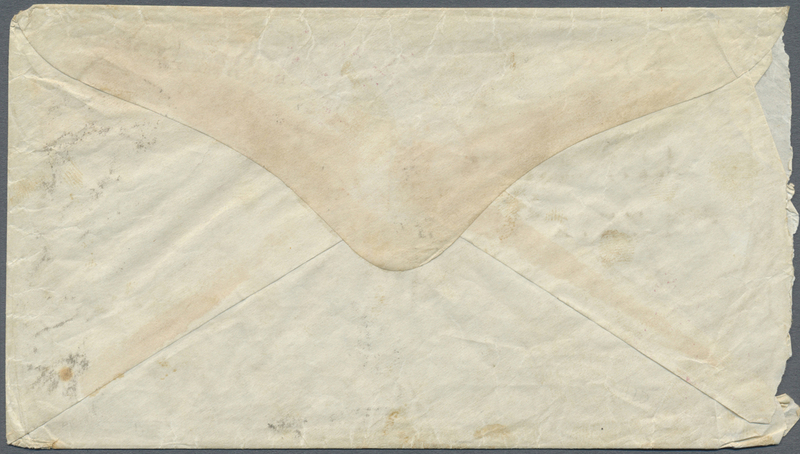 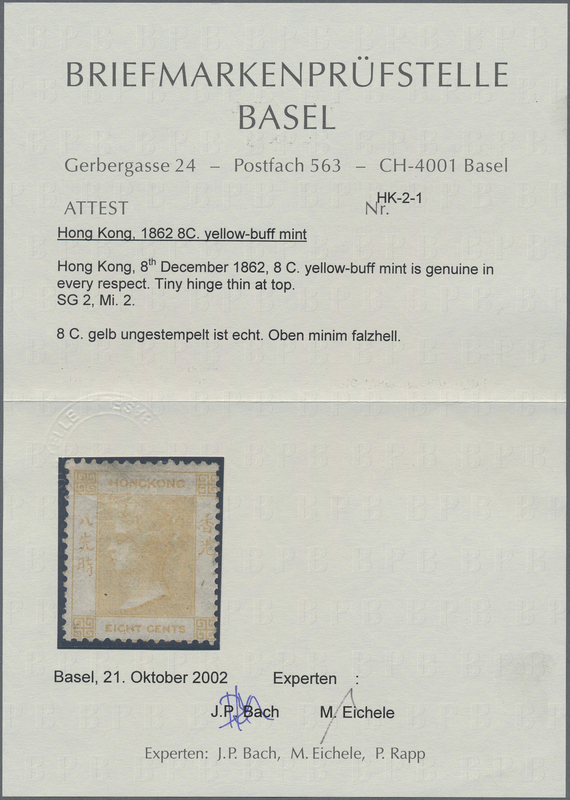 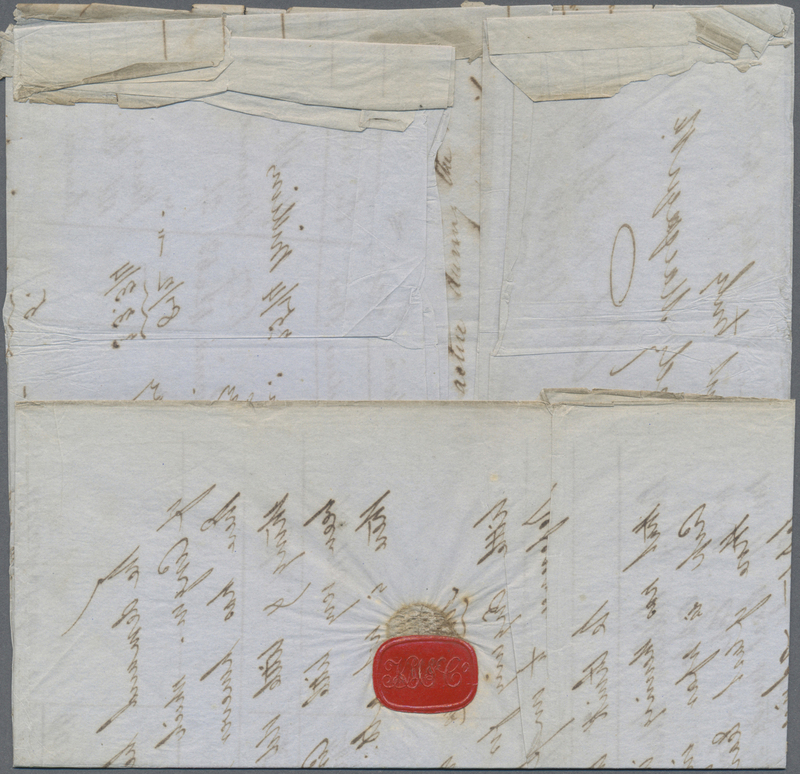 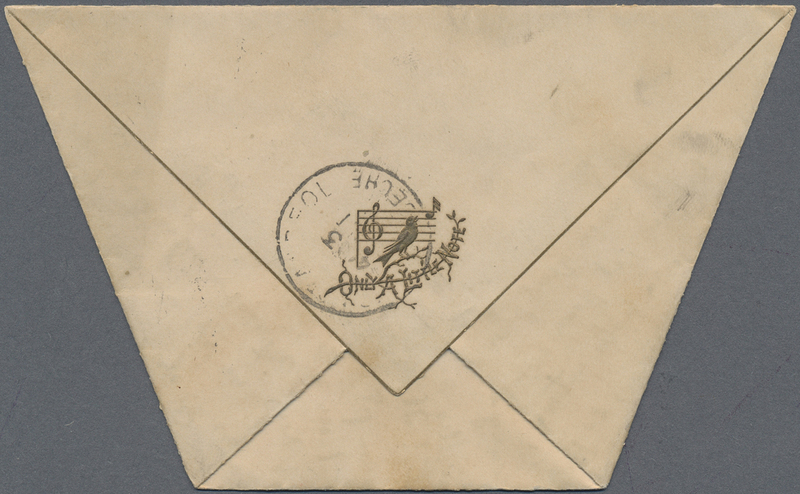 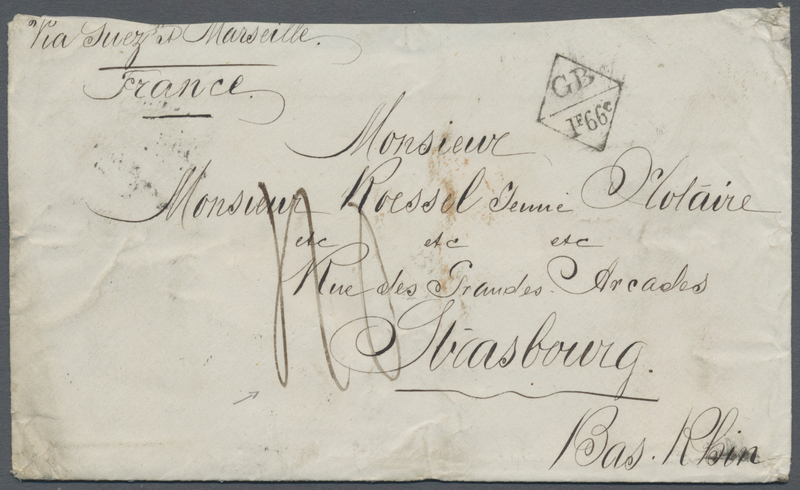 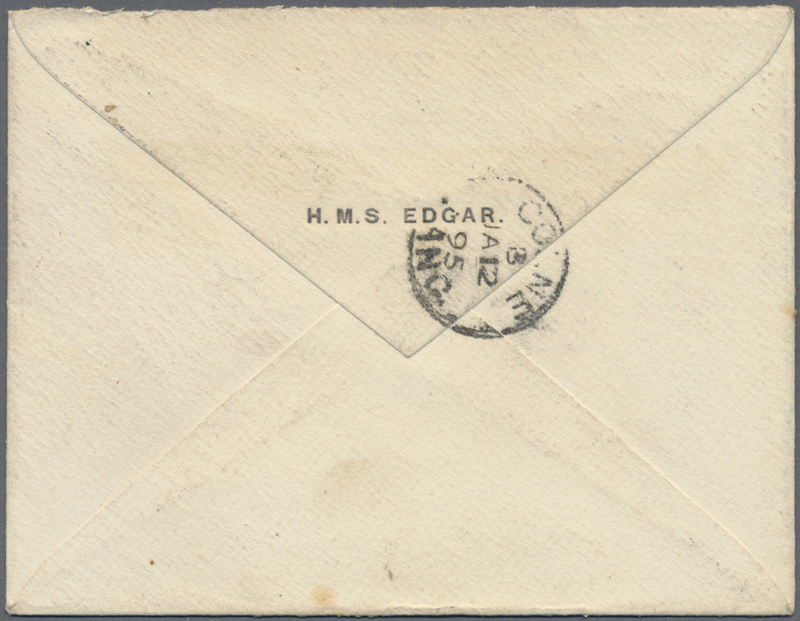 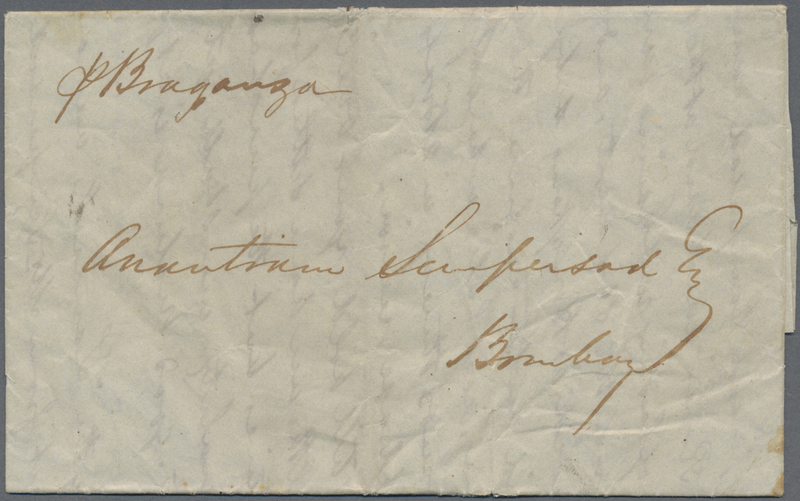 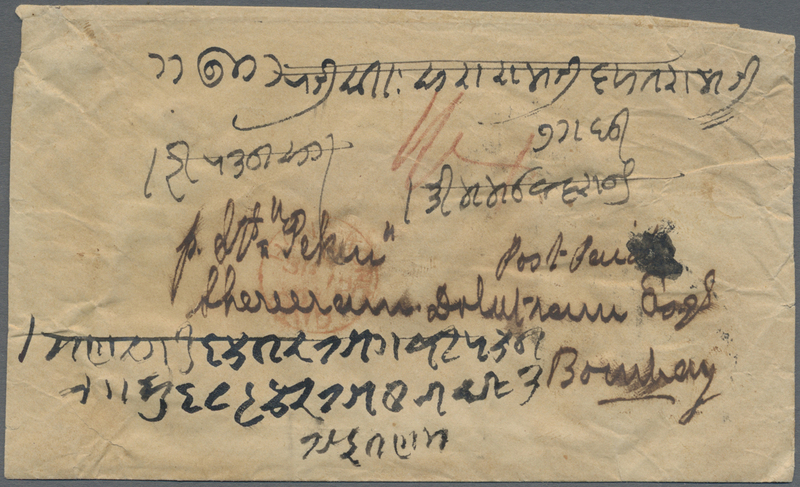 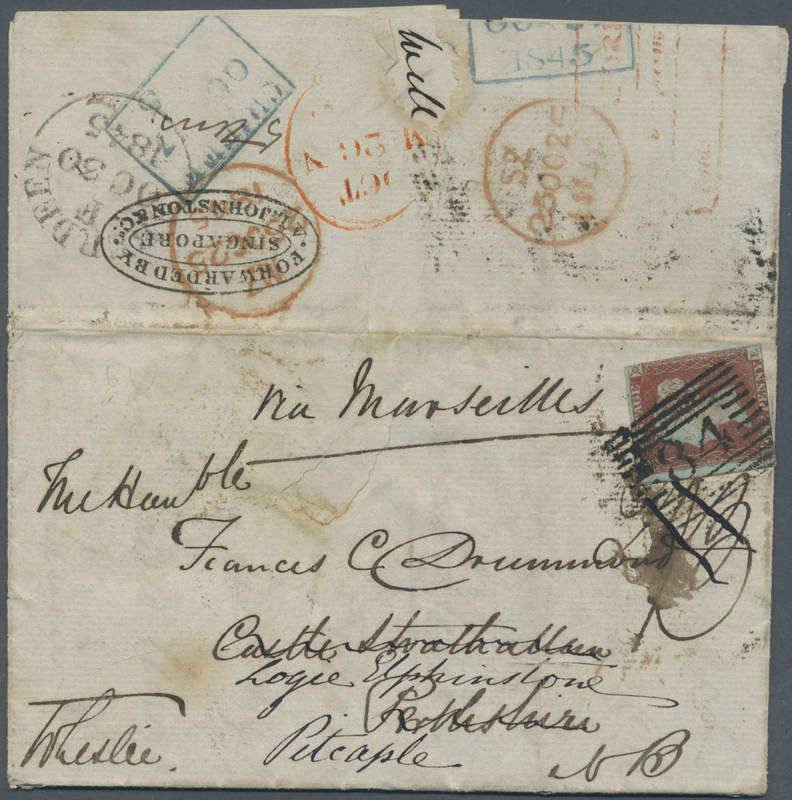 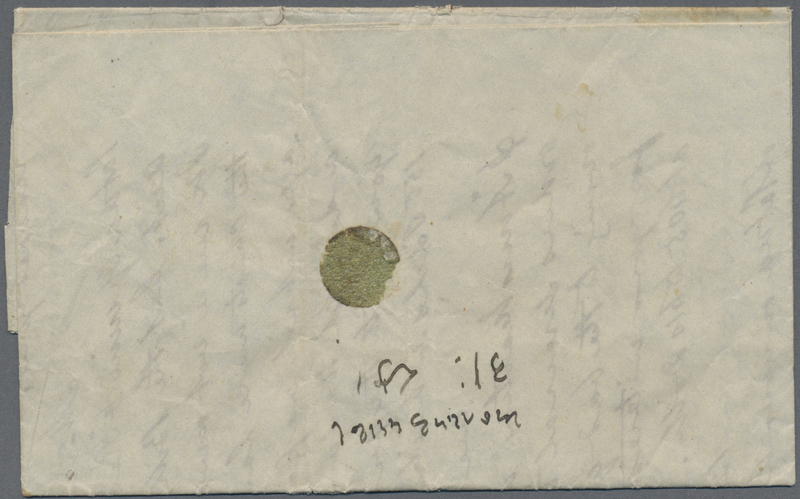 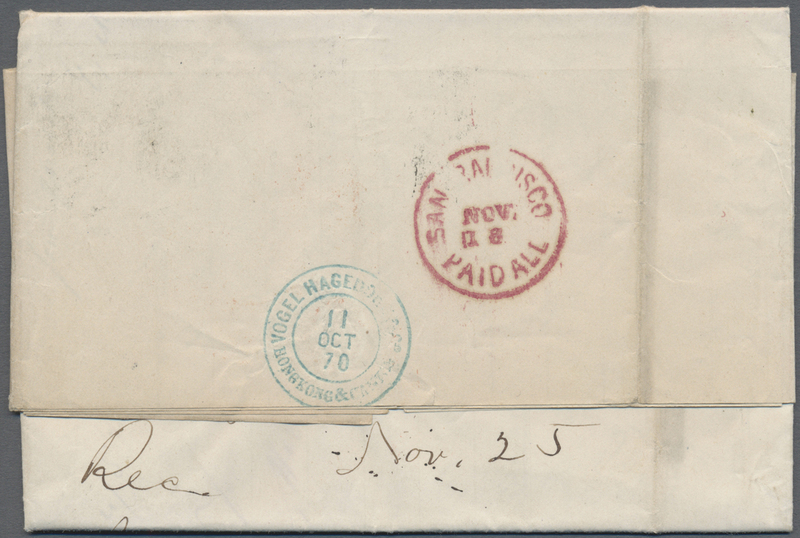 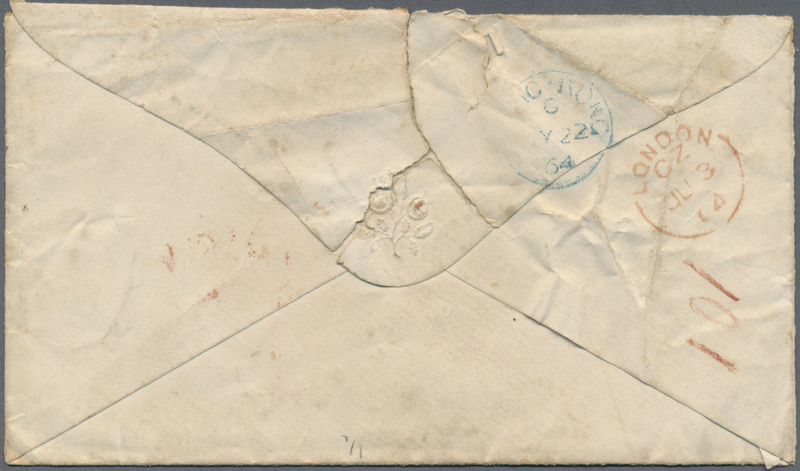 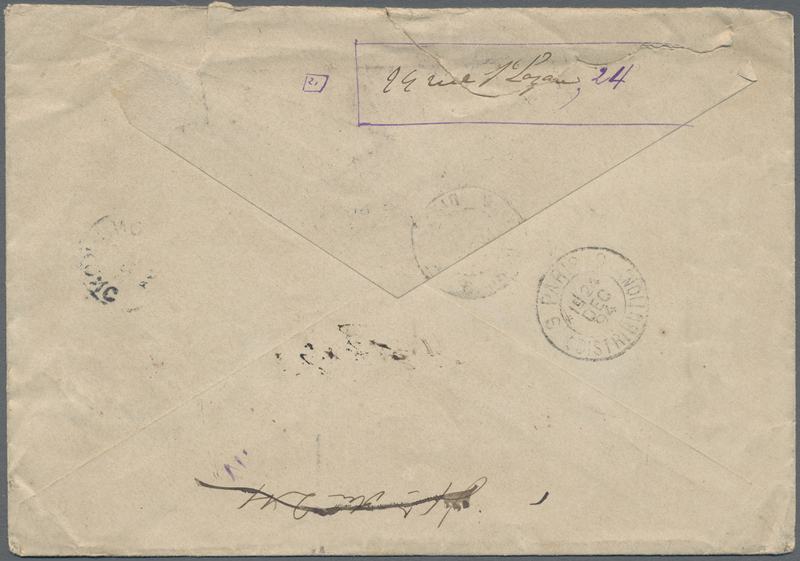 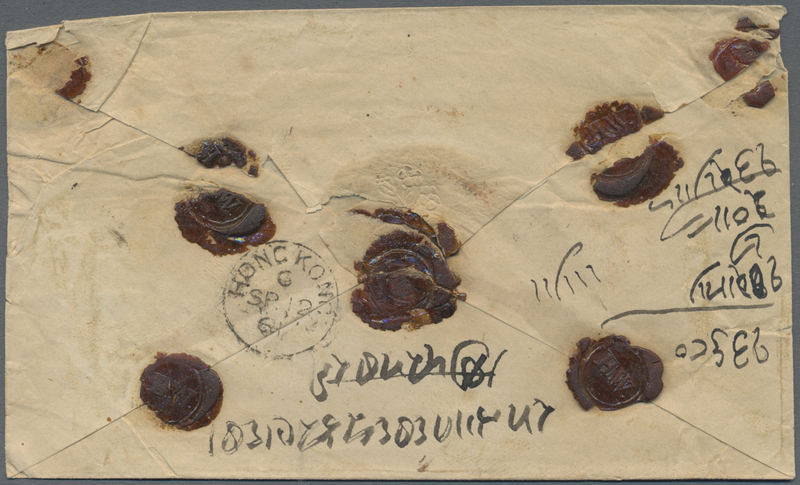 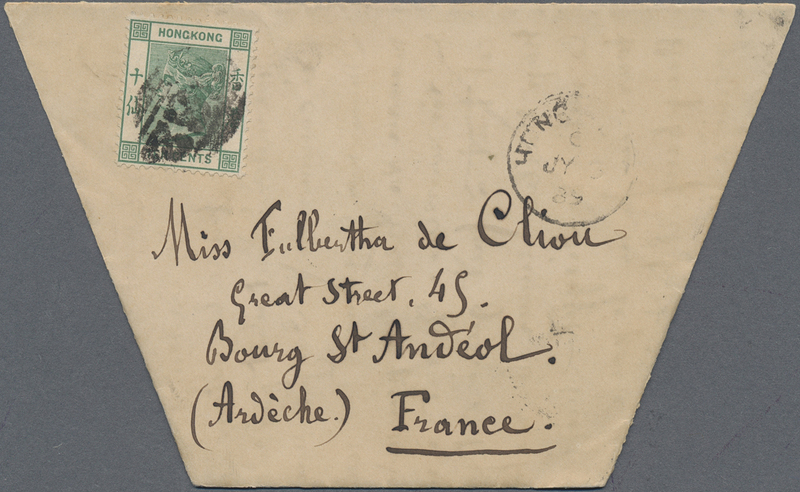 7594 Brief (cover) 1857, to Dutch East Indies: entire folded letter with Hong Kong dateline "27th November 57" addressed to Batavai and endorsed "per Str. 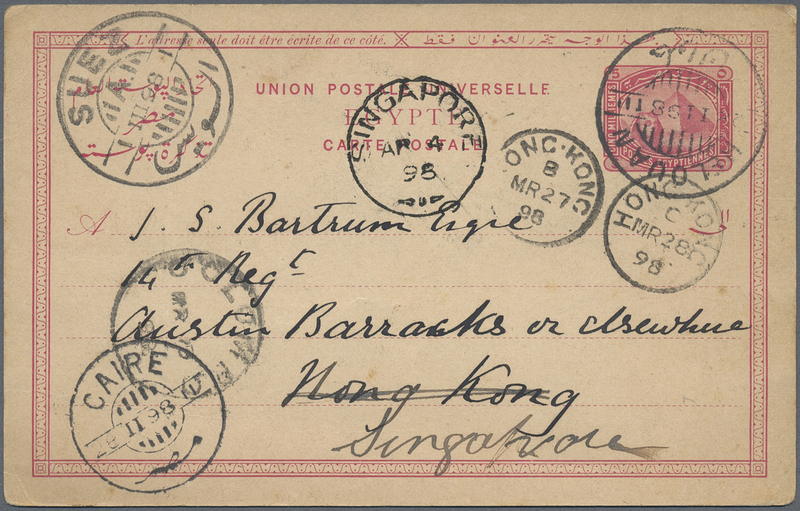 via Singapore" with crowned circle in red "PAID AT HONG KONG" on face and Hong Kong datestamp "NOV 22" on reverse, charged "8" in red crayon for the ship letter and rated "60" (stuvers) on arrival in Batavia. 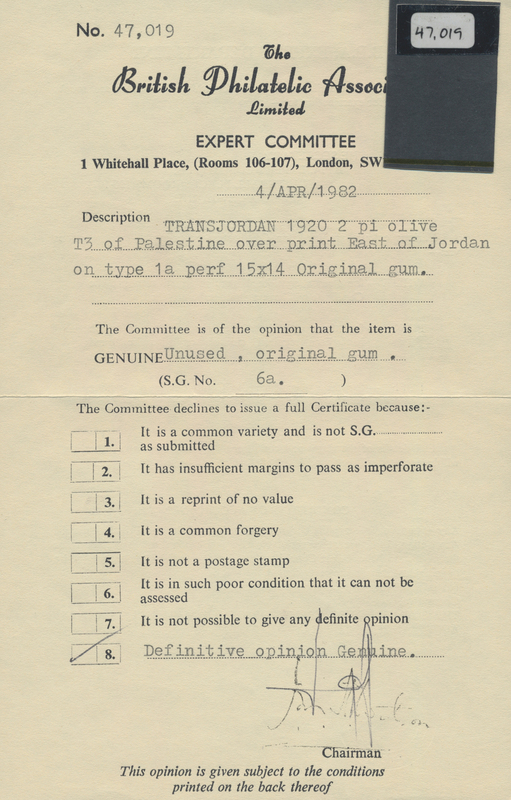 Very fine item. 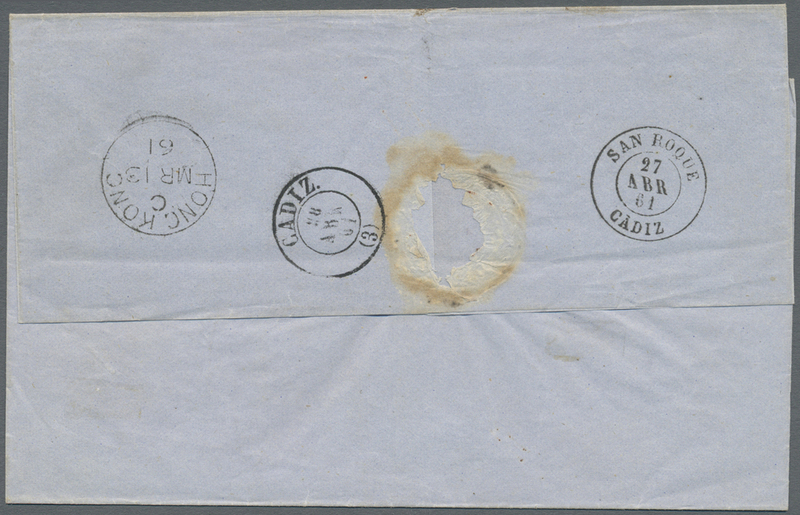 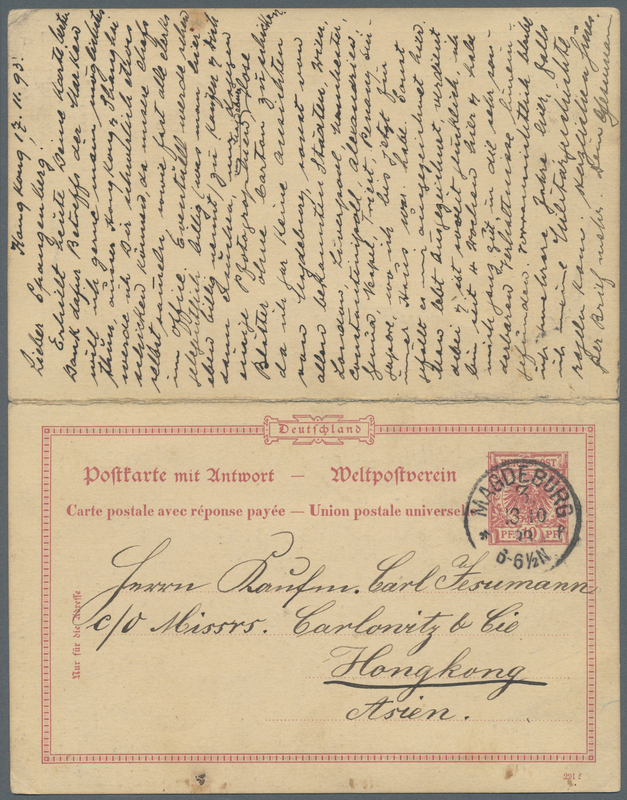 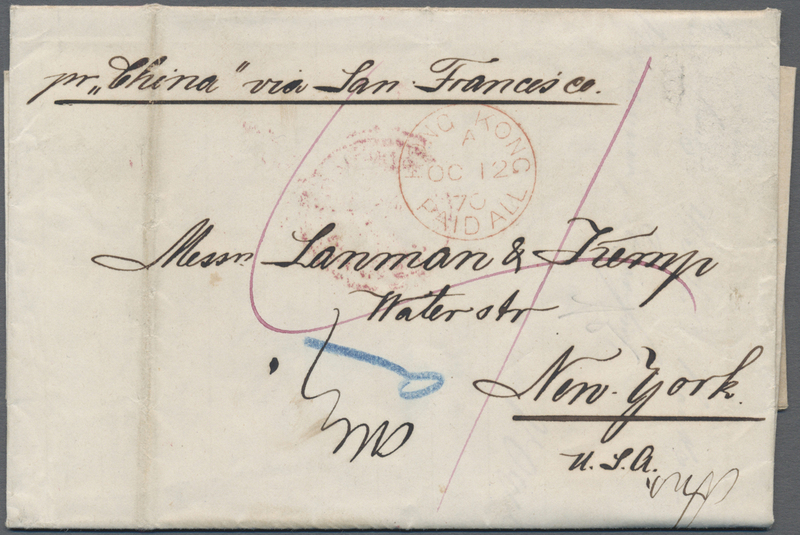 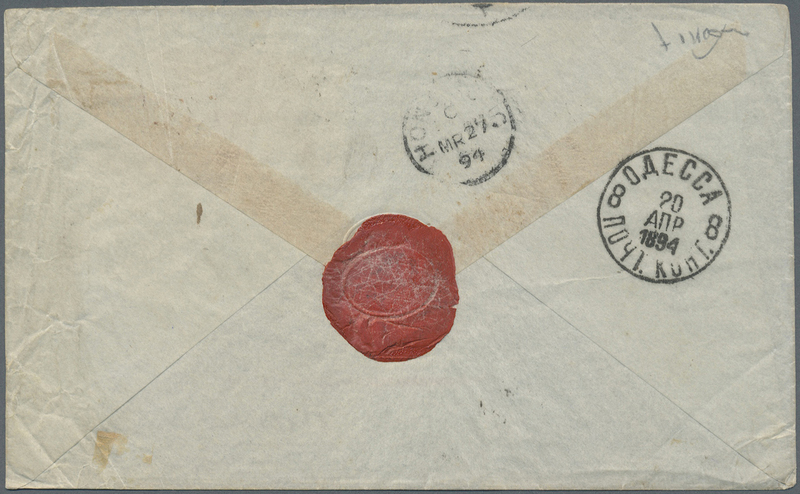 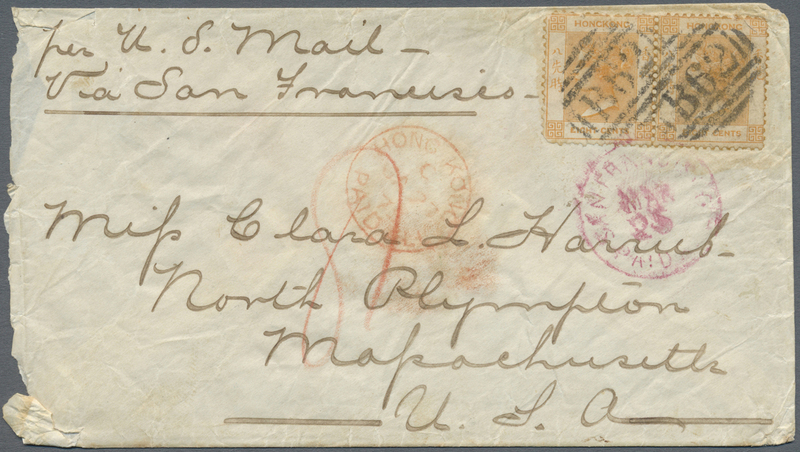 7603 Brief (cover) 1870, entire folded letter written from Hong Kong dated "OC12 70" addressed to New York cancelled by "HONG KONG / PAID ALL" in red endorsed "Per steamer 'China' via San Francisco, "SAN FRANCISCO PAID ALL" transit in red on reverse "NOV 8" and rated "4" in carmine ink for the ship letter. 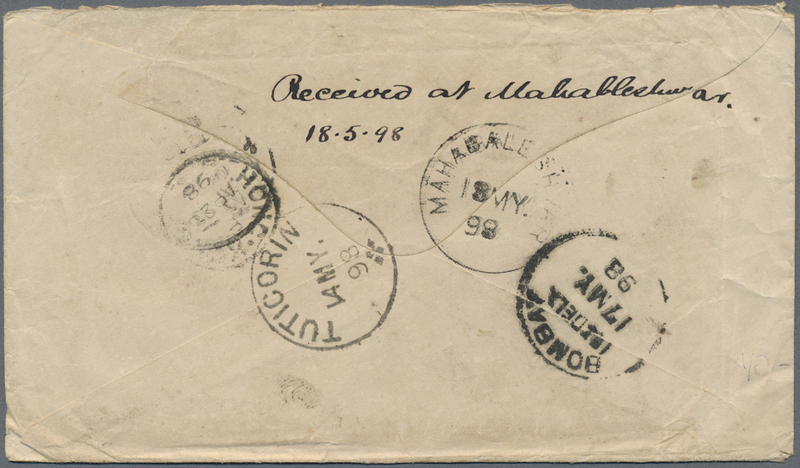 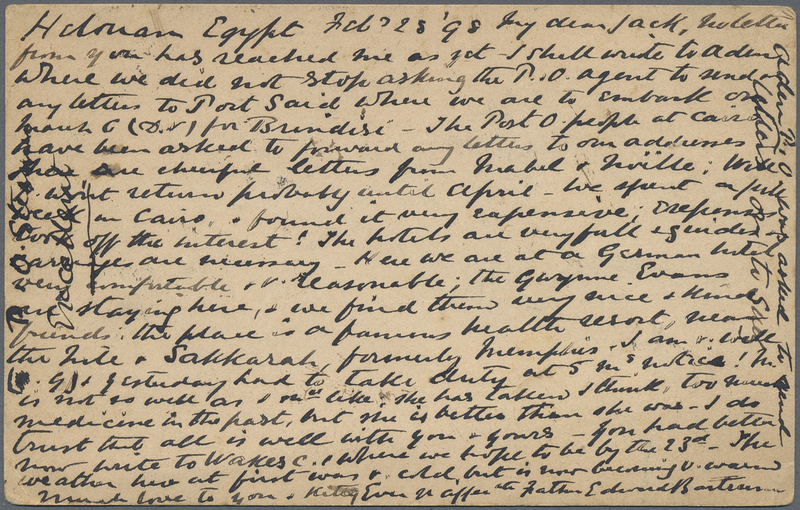 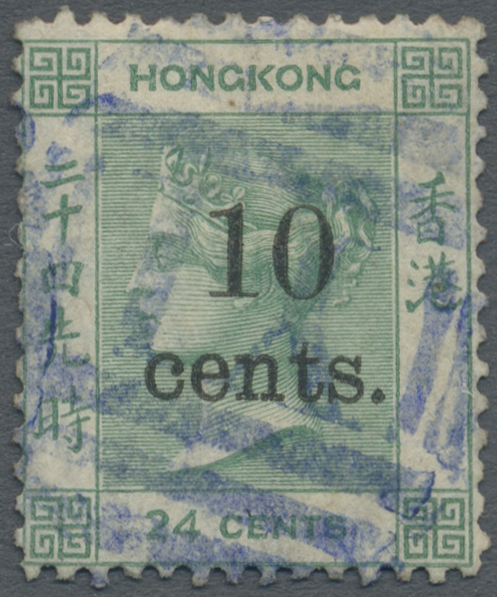 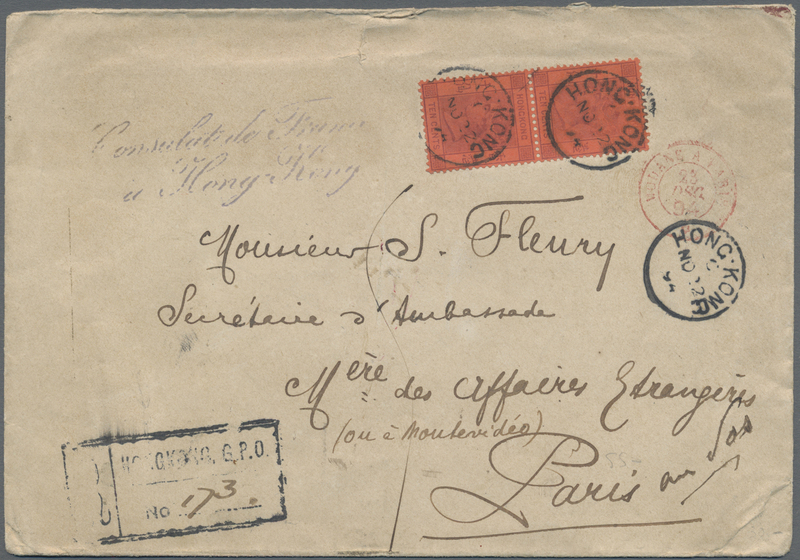 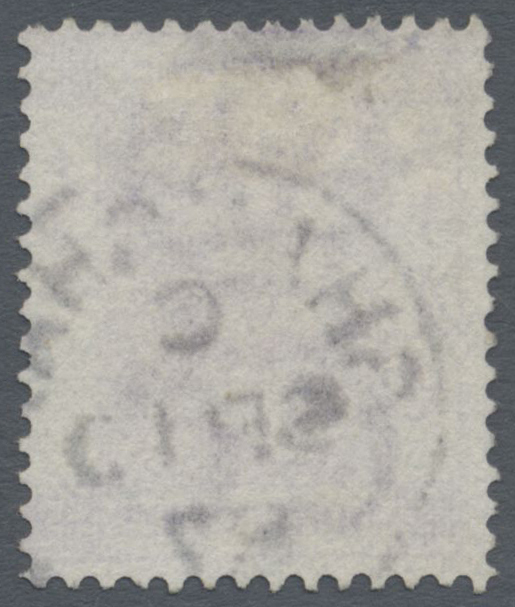 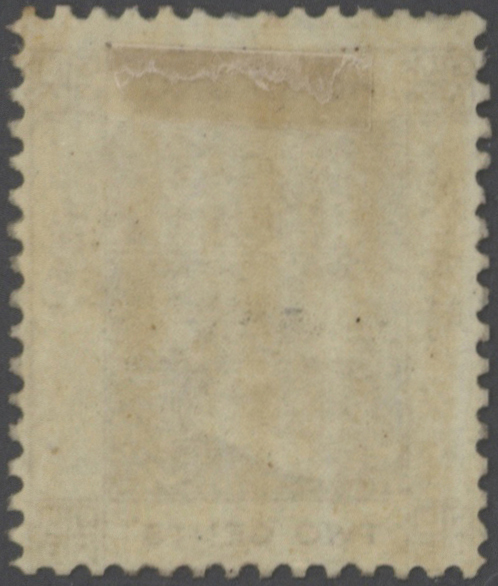 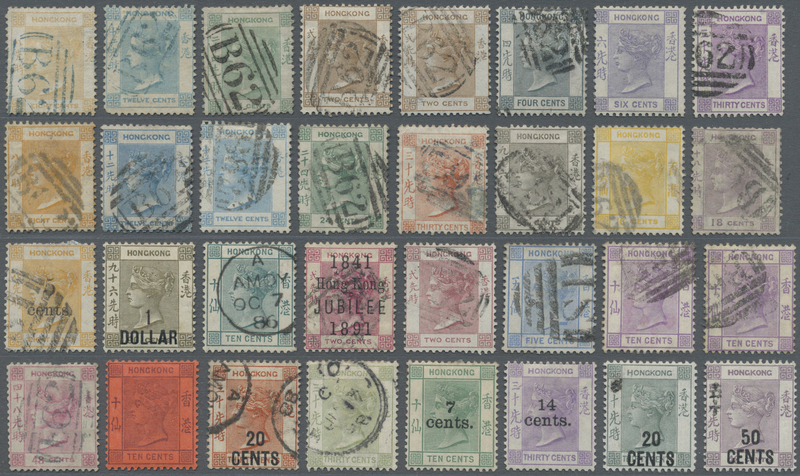 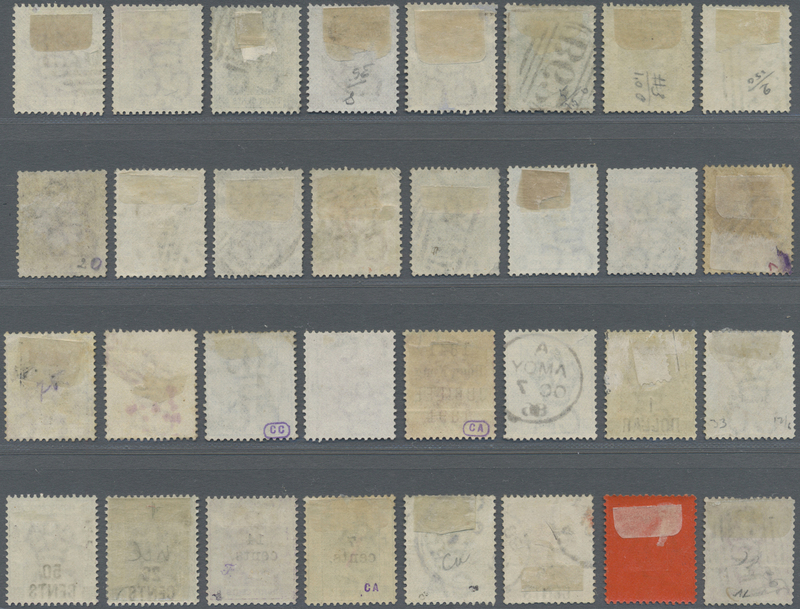 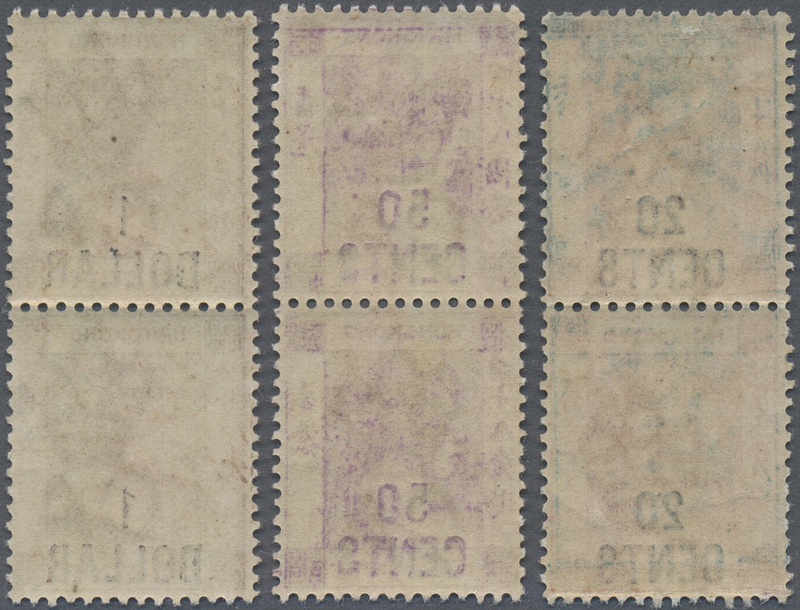 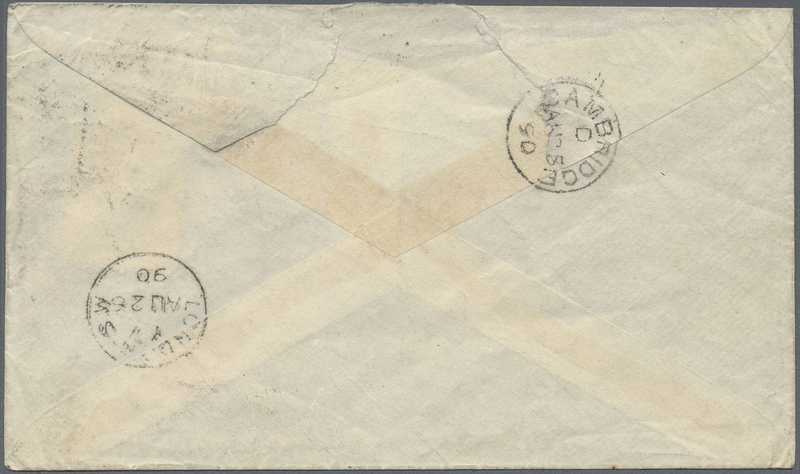 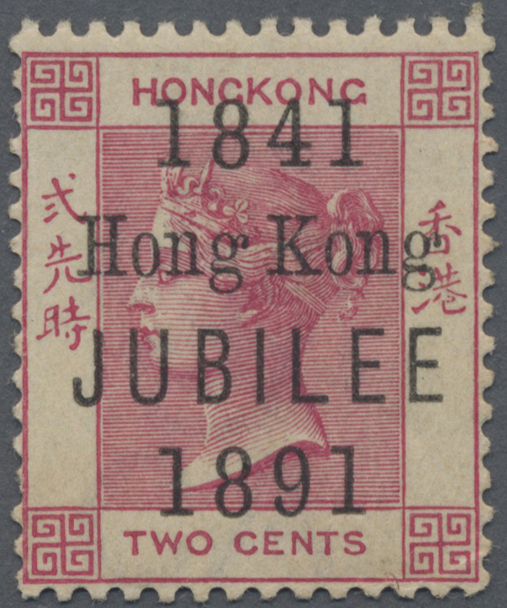 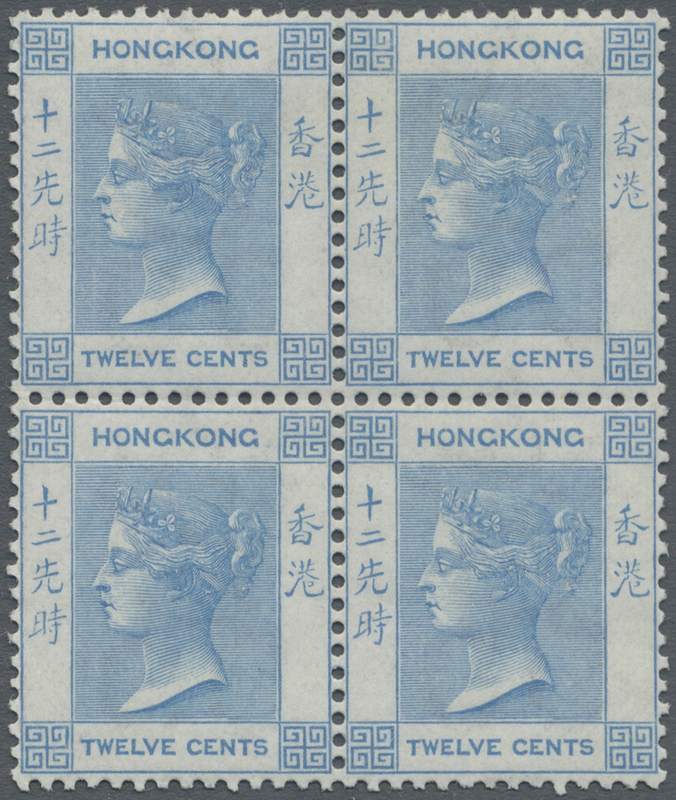 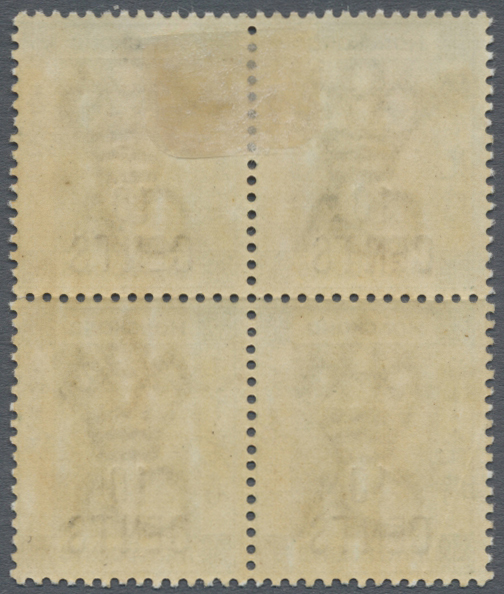 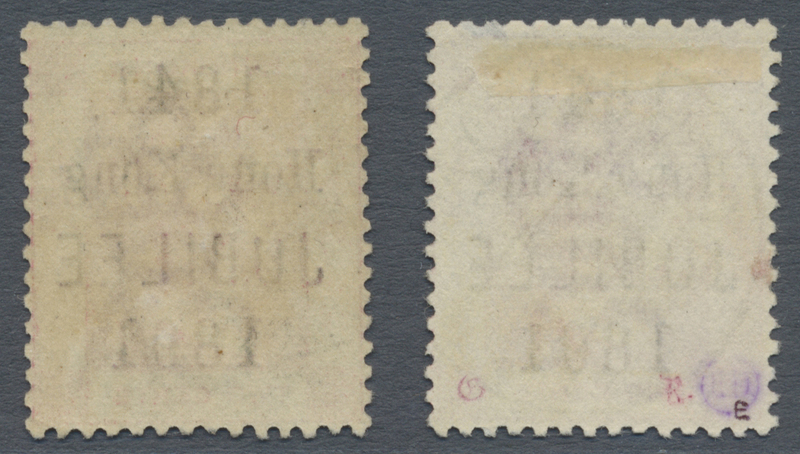 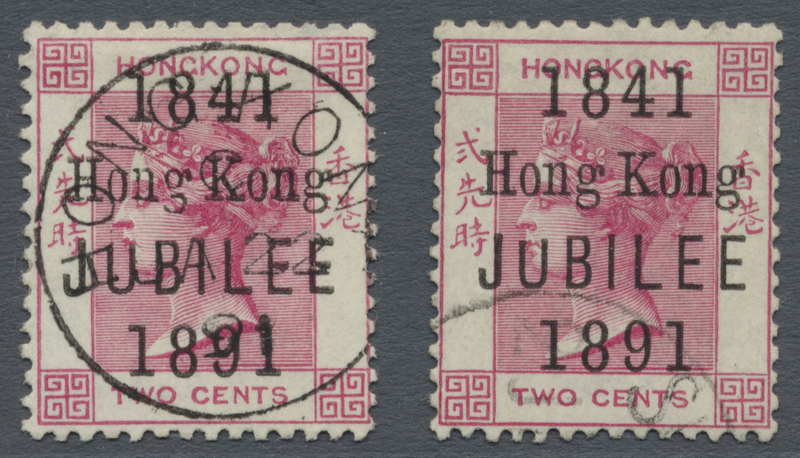 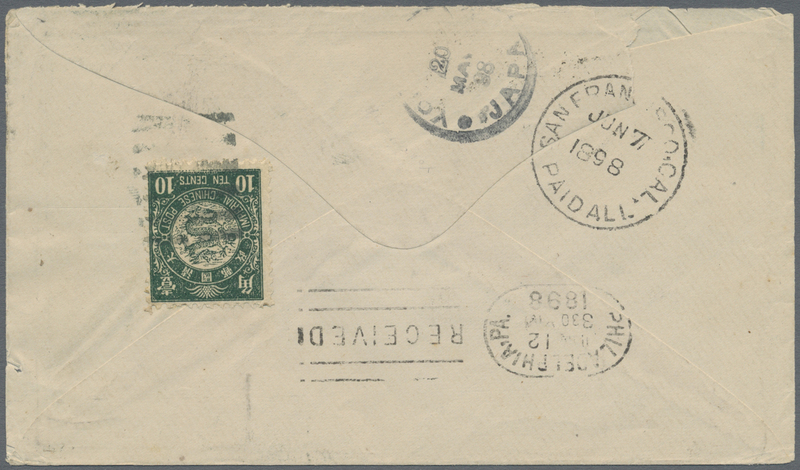 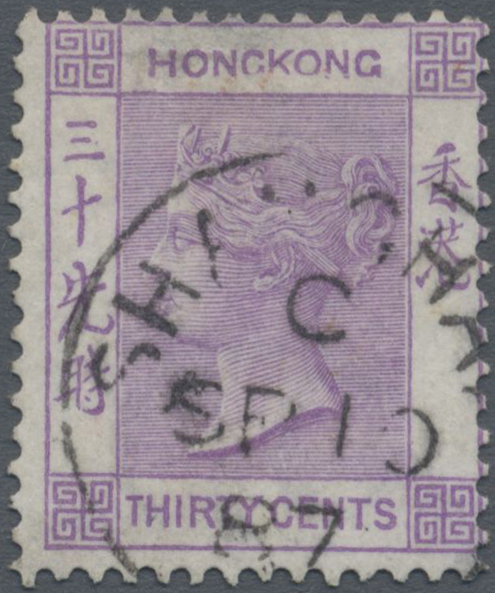 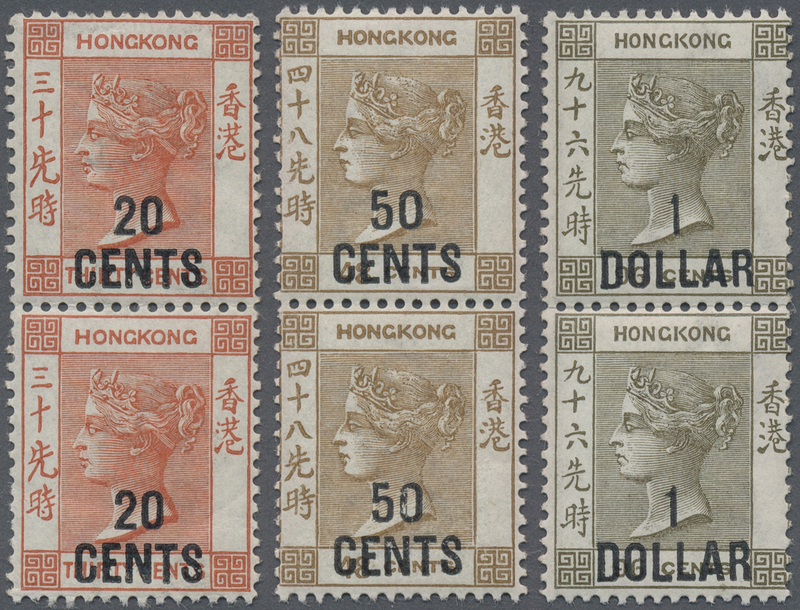 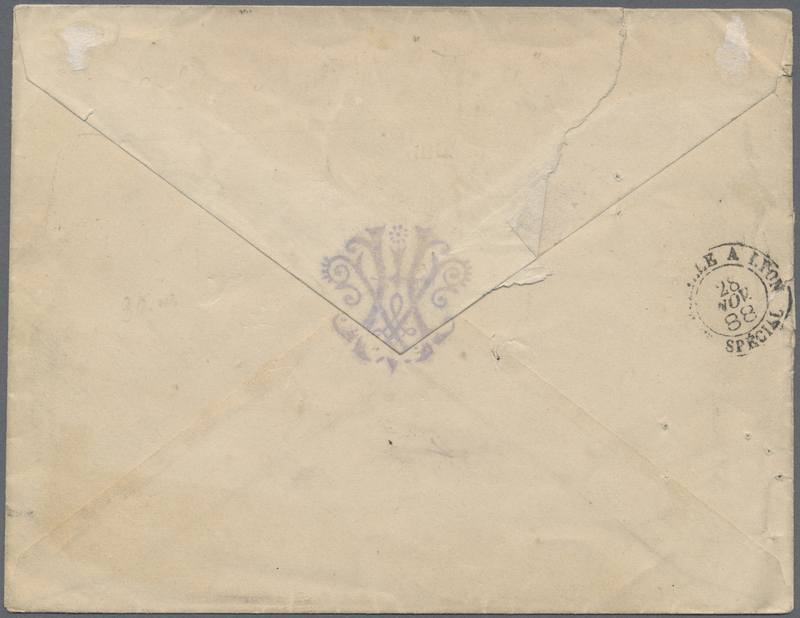 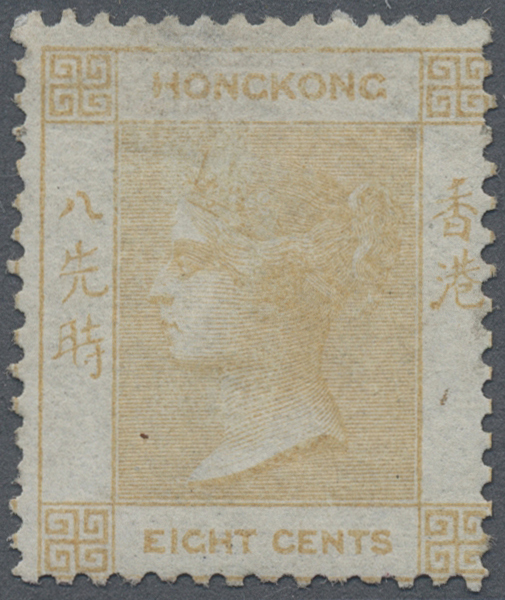 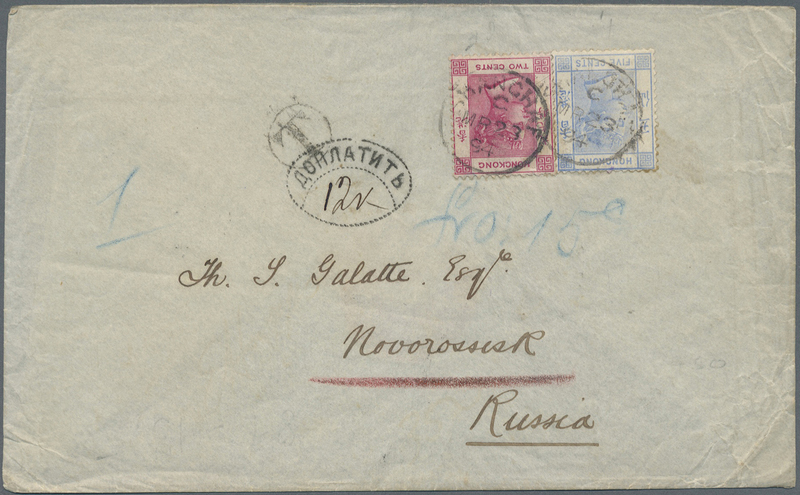 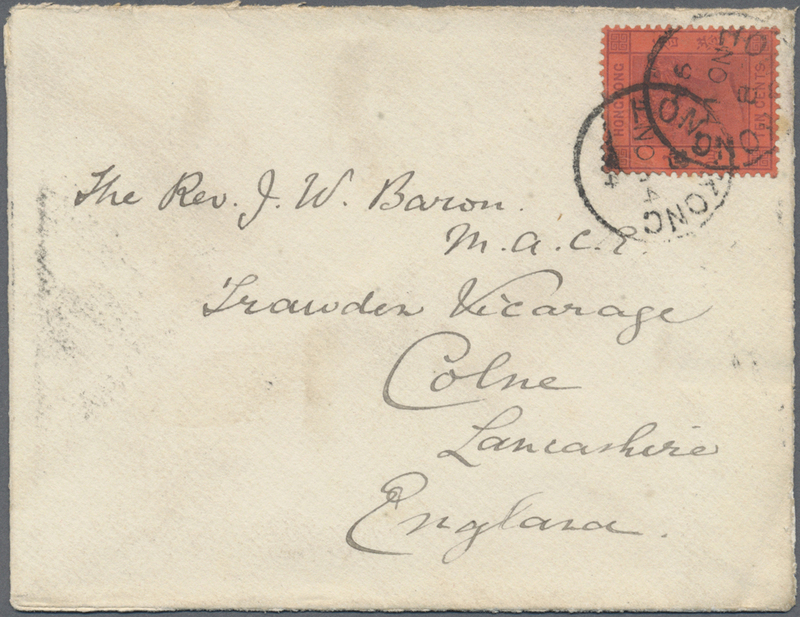 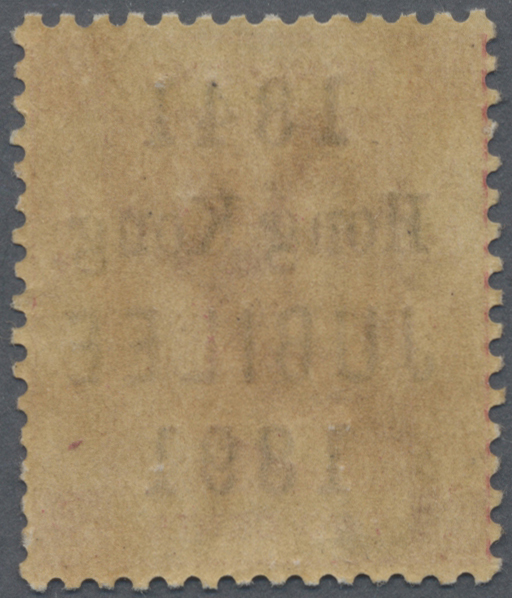 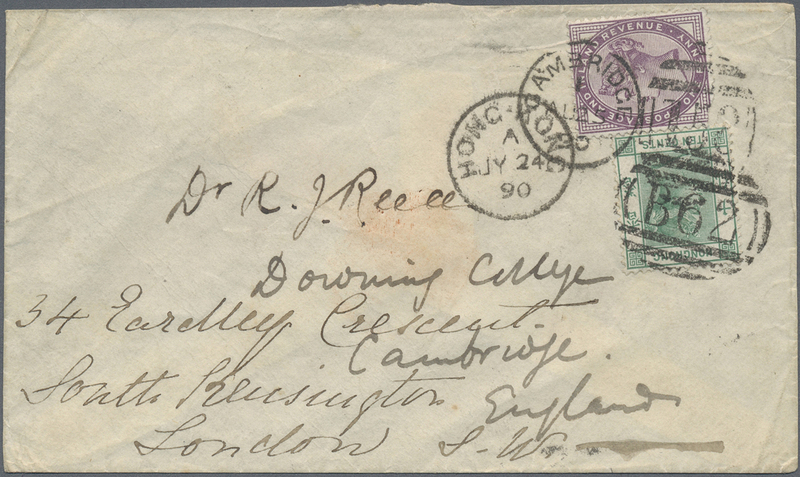 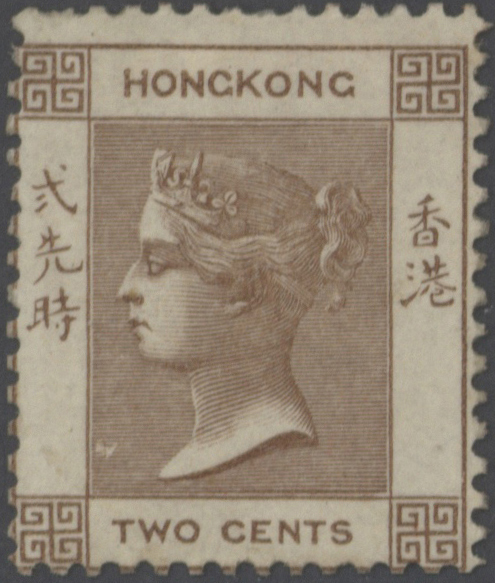 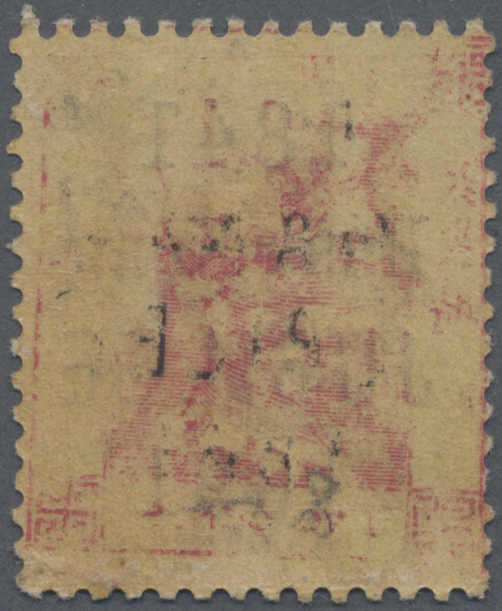 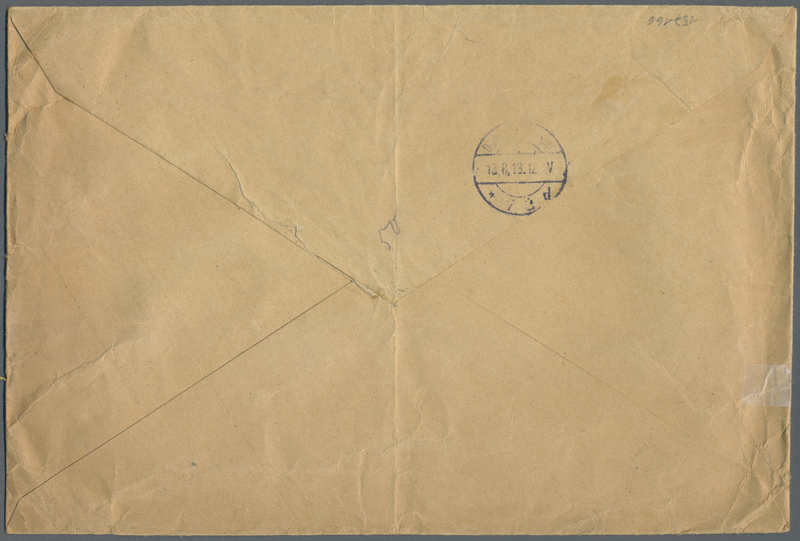 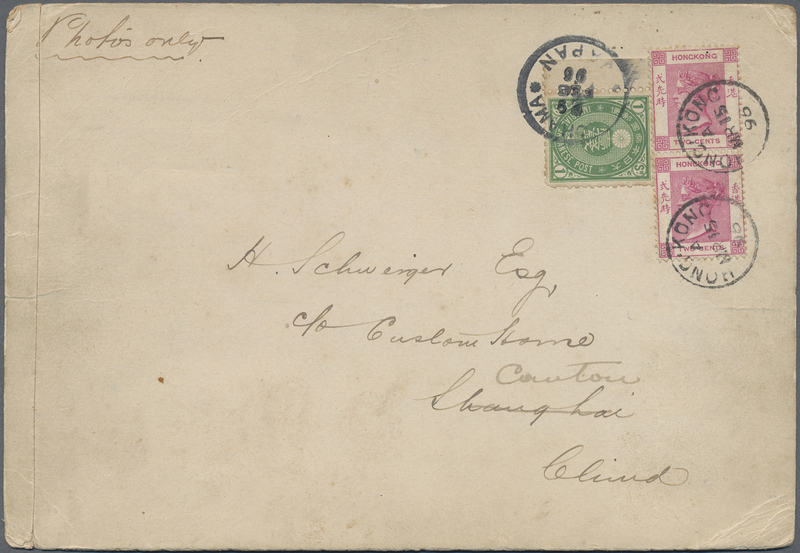 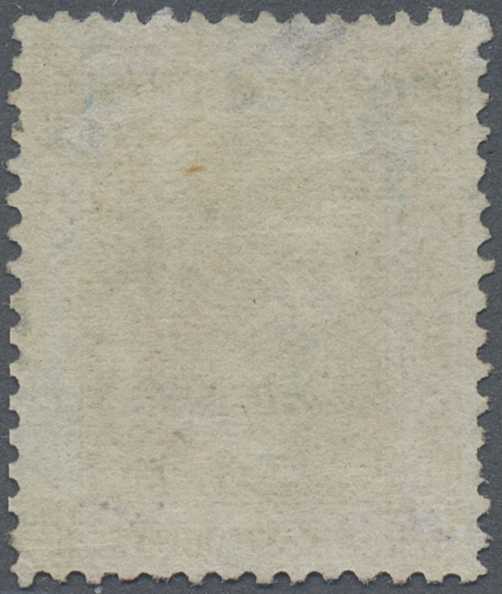 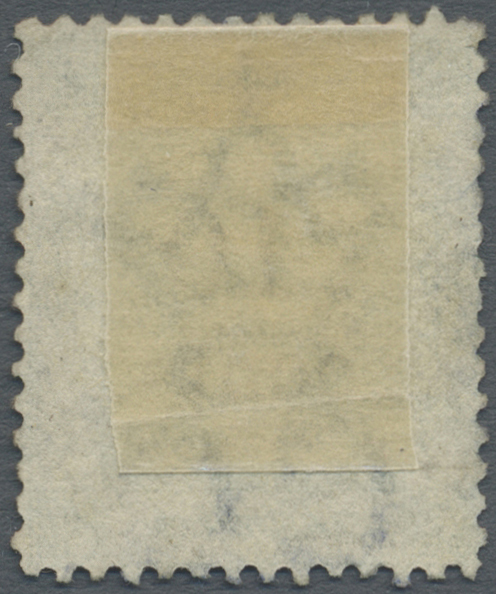 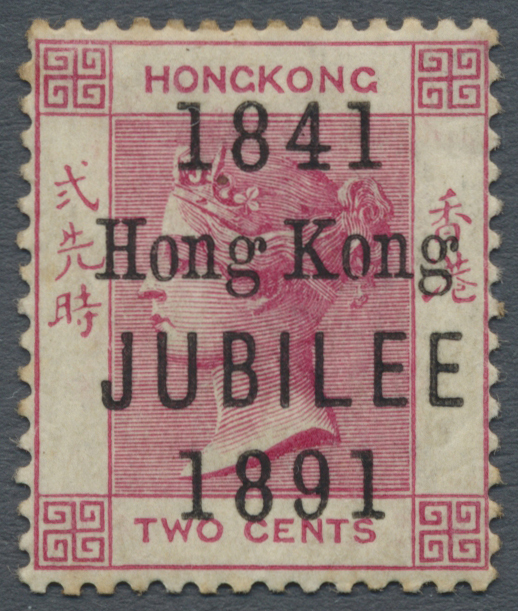 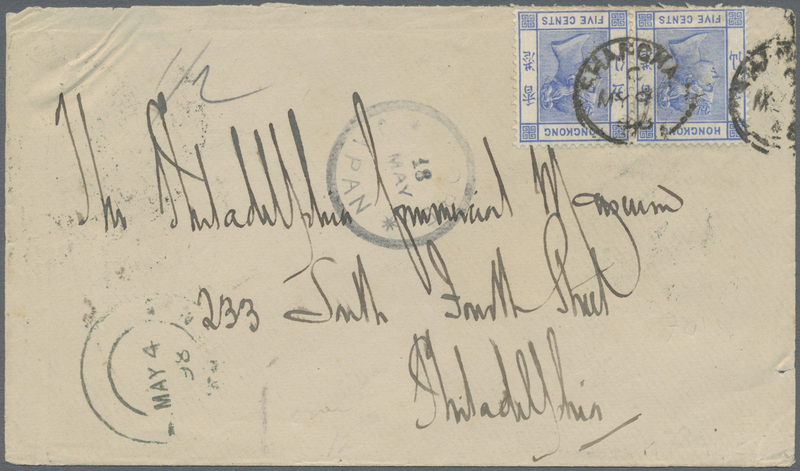 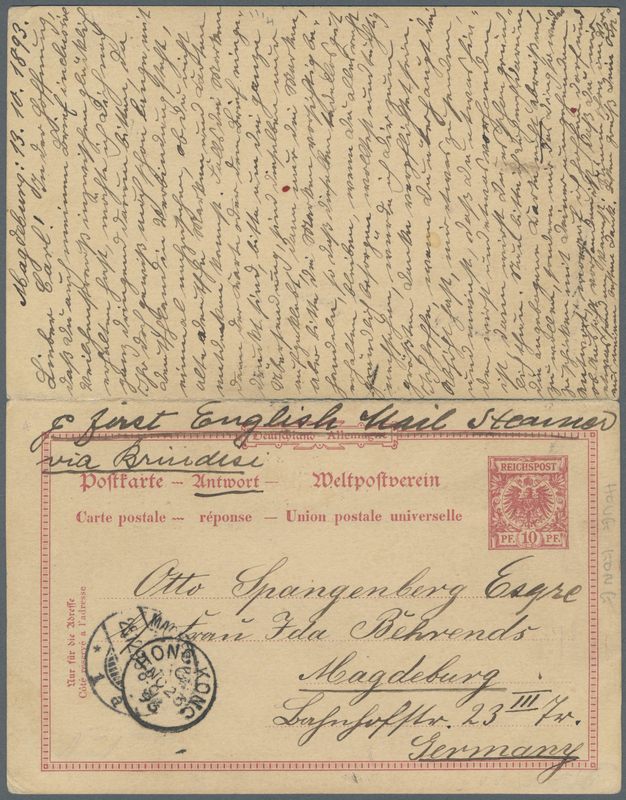 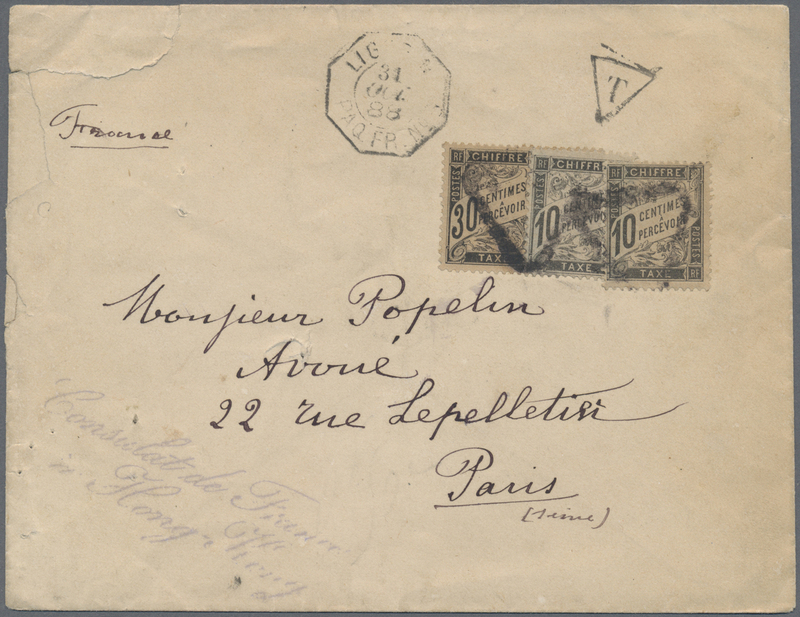 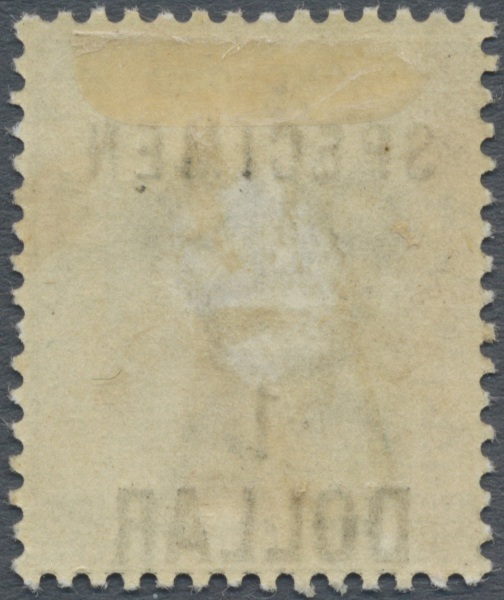 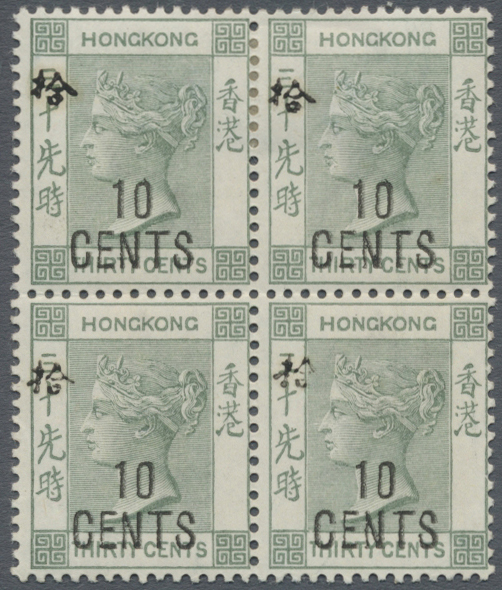 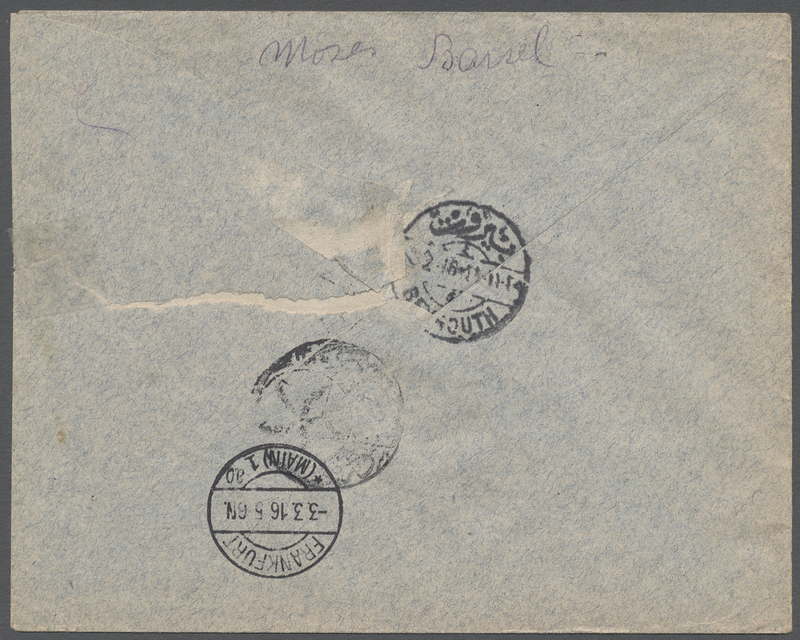 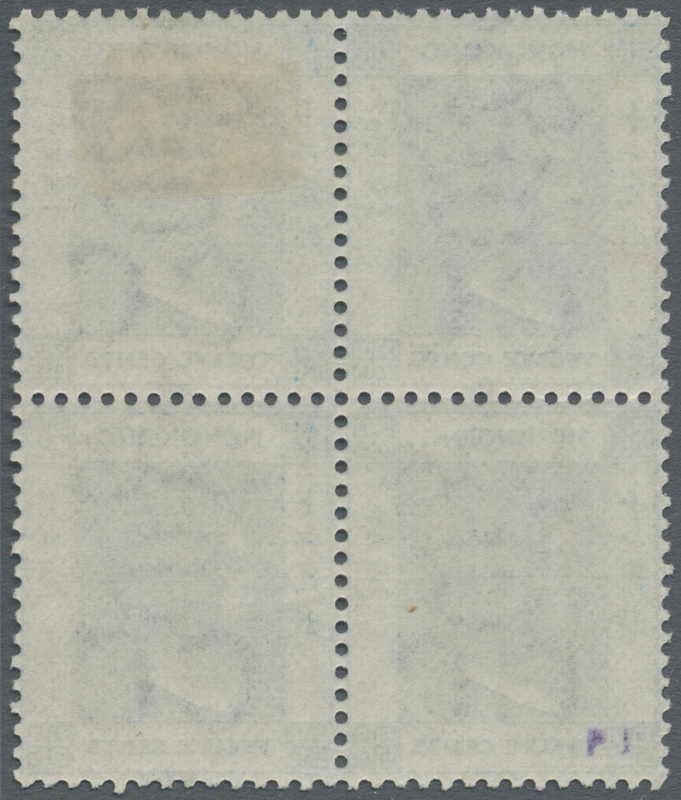 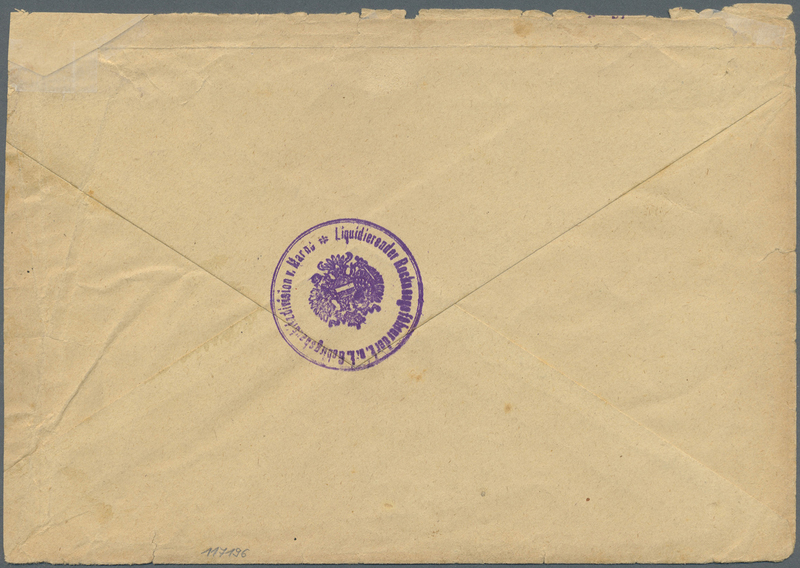 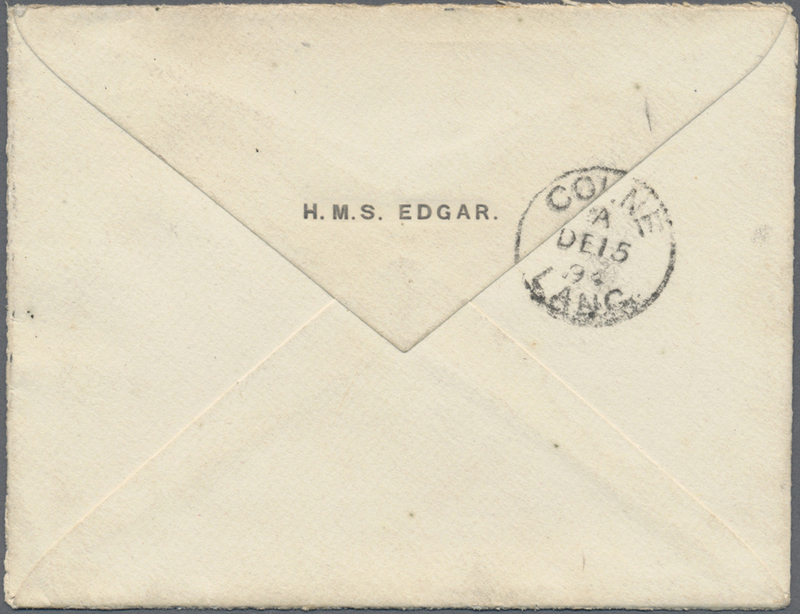 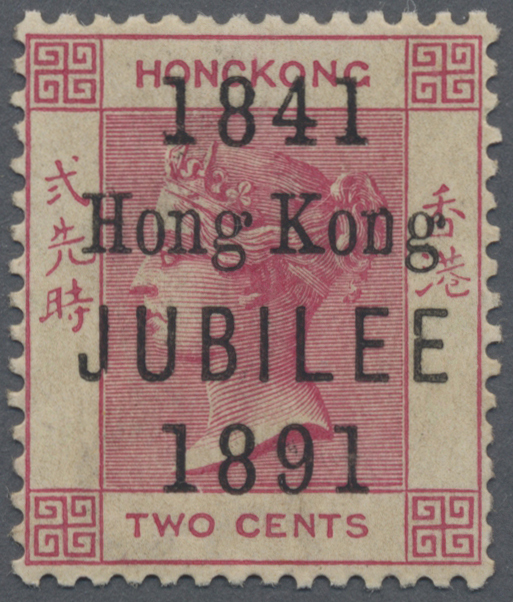 7625 Brief (cover) 1898, QV 5 C. ultra pair tied "SHANGHAI C AP 25 98" to cover via Hong Kong and Turicorin to Bombay/India and fwd. 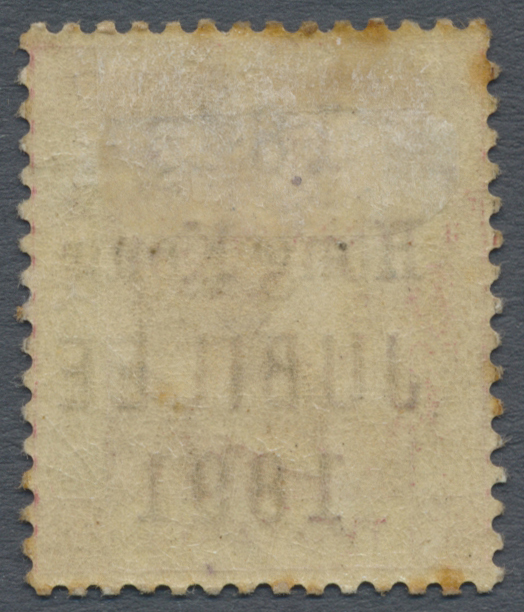 internal to "MAHABALESHWAR 18 MAY 98", toned.